When I first bought my apartment, I thought I knew Paris. As it turned out, I had barely scratched the surface. An outing with my son John helped me fall in love with neighborhoods that I had barely heard of. When John made his first visit, several years ago, I expected to explore history, architecture and museums. But John, adventuresome and irrepressible, took a more creative path. First, he curled up on the sofa with his laptop and L’Officiel des Spectacles, the magazine of Paris events. I asked what he was up to. “Studying possibilities,” he said. Nope. I didn’t. 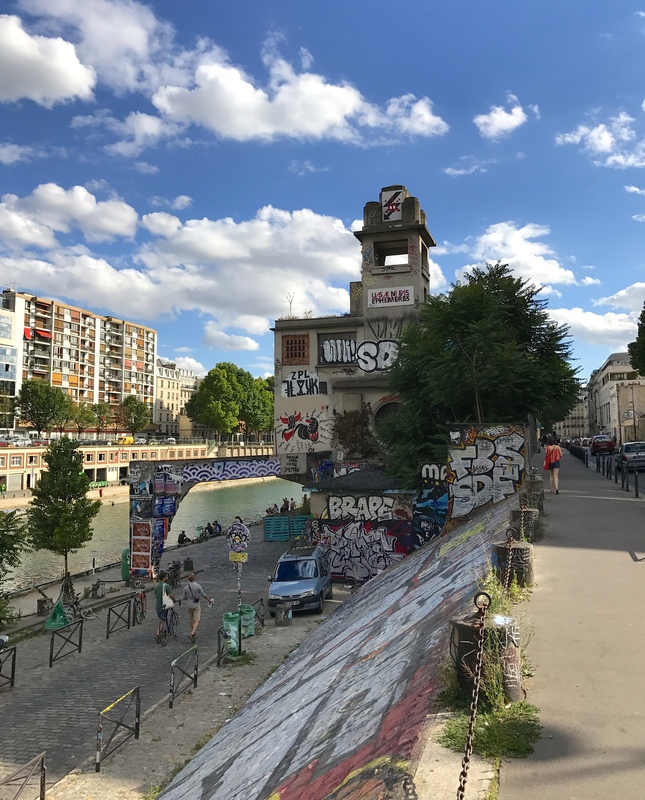 The Tenth arrondissement, the area around the Canal Saint Martin, had a mixed reputation – faded industrial area, low rent district, destination for immigrants and homeless. My only visits had been cruises along the canal – an outdated supply waterway, recently re-discovered by tour companies. I felt a bit intimidated, outside my comfort zone, but lured by the prospect of a new experience. 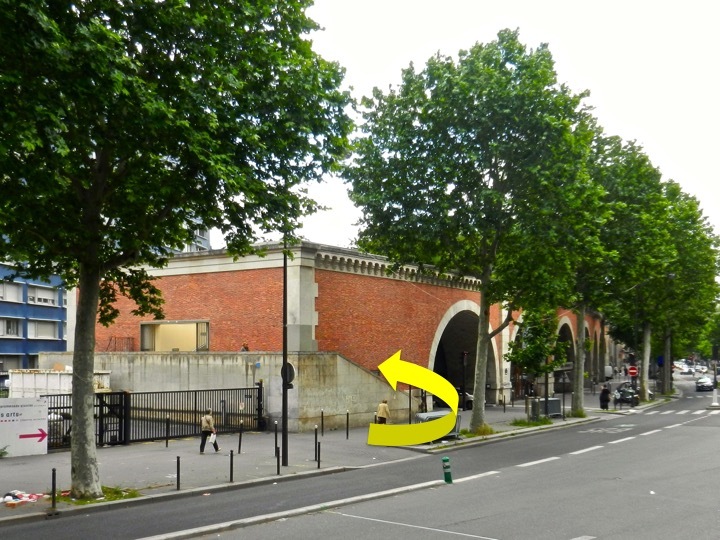 So, armed with GPS and enthusiasm, we navigated to the Louis Blanc Métro and then to the address, 200 quai de Valmy. But it was a locked door marked Livraisons (Deliveries) on a nondescript street. We searched further, passing shabby shops and new office buildings, run-down clubs and hip restaurants. 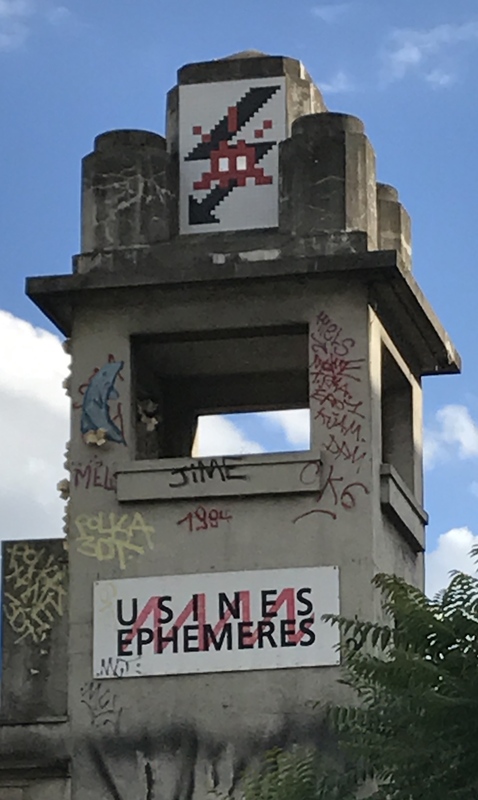 Finally, down a graffiti-covered ramp, on the banks of the canal, we found Point Ephémère, a utilitarian brick building decorated with giant murals. Inside three hundred spectators filled its concert hall – actually a cavernous storeroom painted black. 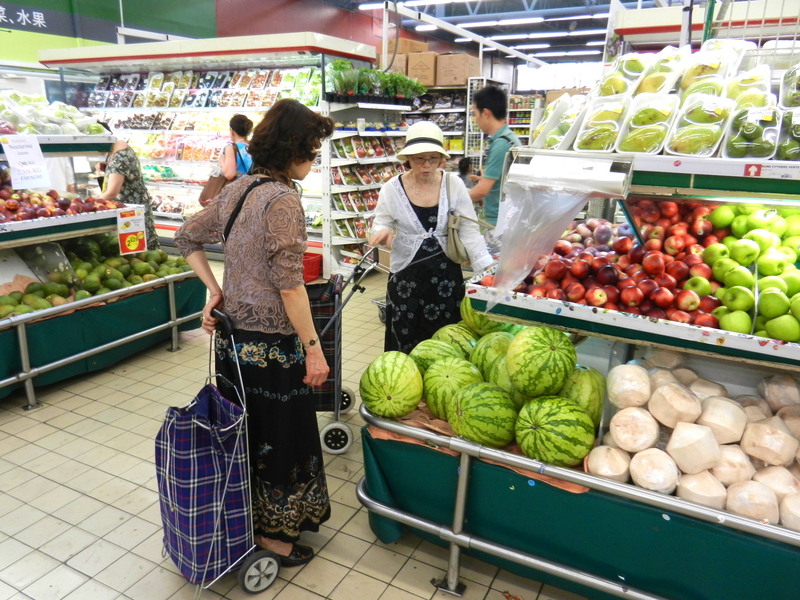 John – taller than most, with curly hair – was easy to follow as he navigated to the bar, past an elderly French couple, a trio of teen-agers in headscarves, and a Chinese-speaking group. 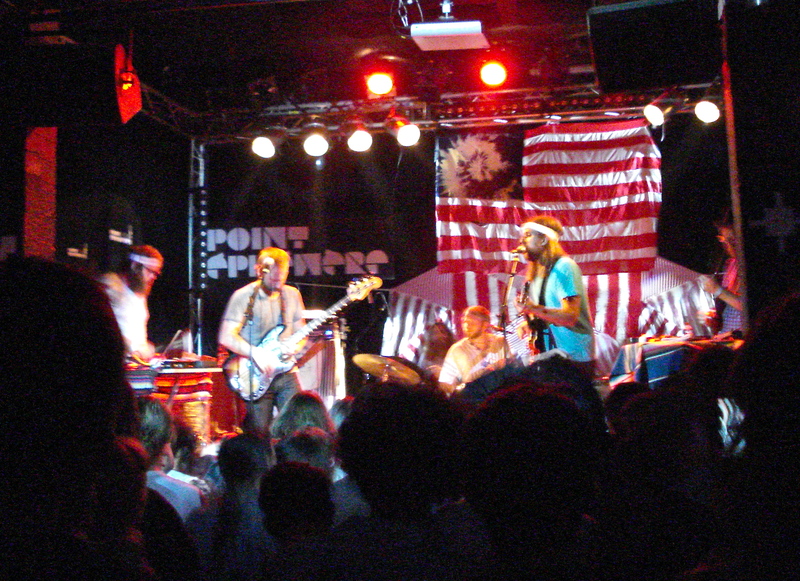 Spotlights illuminated the American flag that served as a stage backdrop. Akron/Family’s music, described in the program’s creative French, was an “inimitable kaleidoscope of musical folk rock psychedelic byways”. John yelled in my ear, “Listen to the lyrics!”. Impossible over the band and crowd, but who cared? I was having a blast. At intermission we sat on the berges (banks), watching street lights, dark water and the reflections of pedestrian bridges. Across the canal were the tents of personnes sans-abri (homeless). Next door was a fire station, and occasionally an ambulance made its way among the café tables. “Are you glad we came?” John asked. Absolutely I was. I laughed to myself. 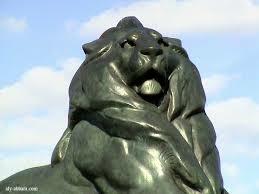 I had anticipated grand monuments, medieval streets and masterpieces. 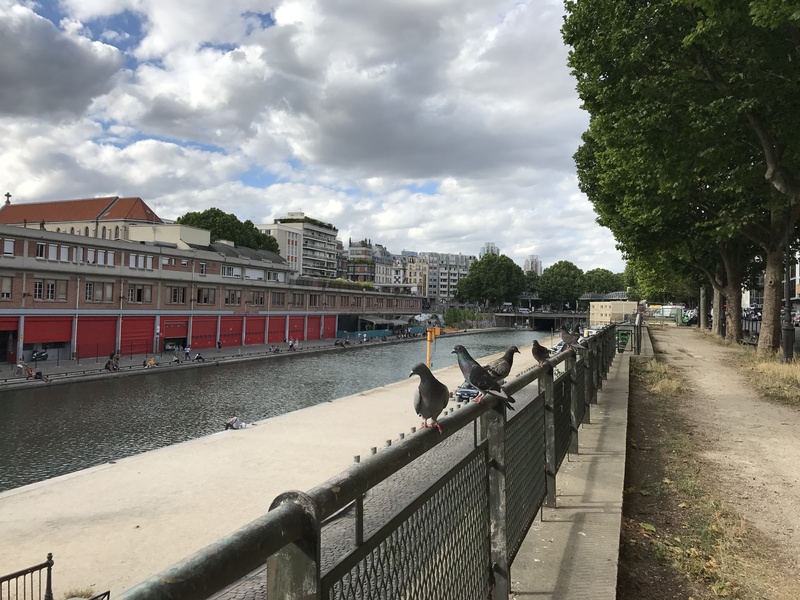 Instead John had uncovered a multicultural crowd, eclectic music and an emerging neighborhood, on a 19th-century canal. And he had broadened my Paris passions. Since then, I love exploring the city’s transitional neighborhoods – Belleville, Little Jaffna, Barbès, Goutte d’Or, Château d’Eau, Saint Denis. Some are rich with businesses, markets and art. In some, the challenges of poverty and crime are enormous. But the future of the city is developing there, among African hairdressers, Indian silk vendors, Chinese grocers, Mexican street artists, Moroccan restauranteurs, parents pushing prams and engineers toiling in converted warehouses. I want to get to know it all. http://www.pointephemere.org/ An abandoned 1930 construction materials warehouse found new life in 2004 as an artists’ space. It holds residences, performance areas, an art gallery and a café. It was created by Usines Éphémères, a team that converts unused buildings into art destinations. 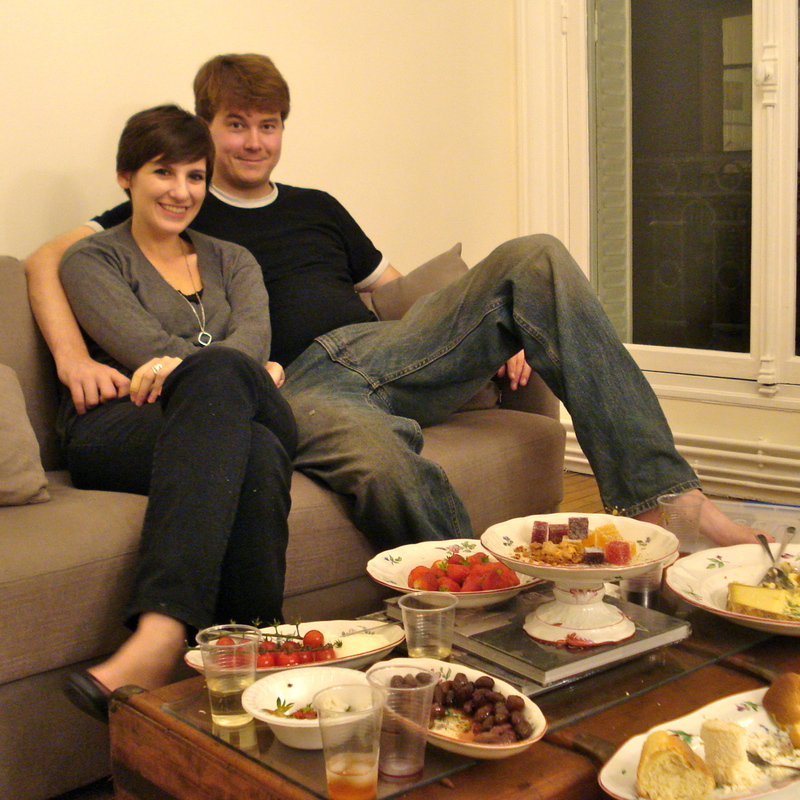 A few weeks after I bought the apartment, my son Rob and his girlfriend Lauren came to visit. I impulsively organized a party so my friends could meet them. Then I realized how empty the apartment was – the only furniture was a sofa and two chairs. I wanted something more, and finally decided, the night before the party, that I had to have a coffee table. 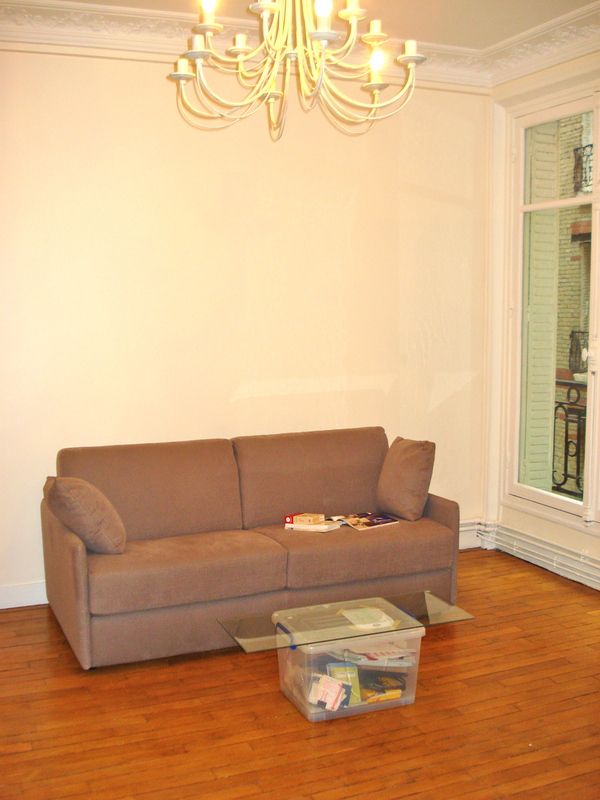 A lonely sofa and plastic storage bin in my practically empty living room, October 2009. See the room as it looks today in the photo at the end. So on Saturday morning, eight hours before the party, we trekked to the legendary flea market, Marché aux Puces de Saint-Ouen. With 2,500 vendors, how hard could it be to find a second-hand table basse* with a little character? But by mid-afternoon we hadn’t seen an acceptable table. 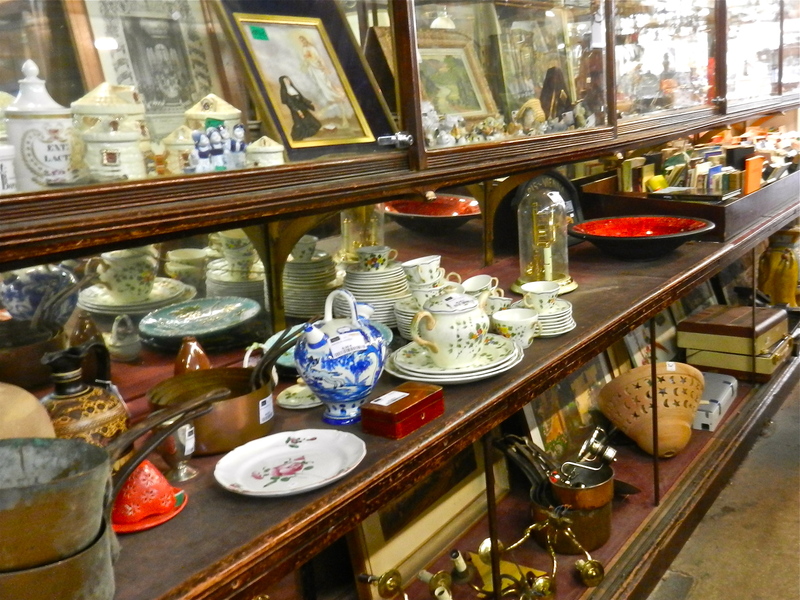 This led us to the Salle des Ventes du Particulier, a home furnishings dépôt-vente* in the 14th arrondissement. “This is where Parisians sell their used furniture,” a friend had told me. Its modest entrance opened to two cavernous floors, 10,000 square feet full of tables and chairs, shelves and bureaus, clocks and sofas. 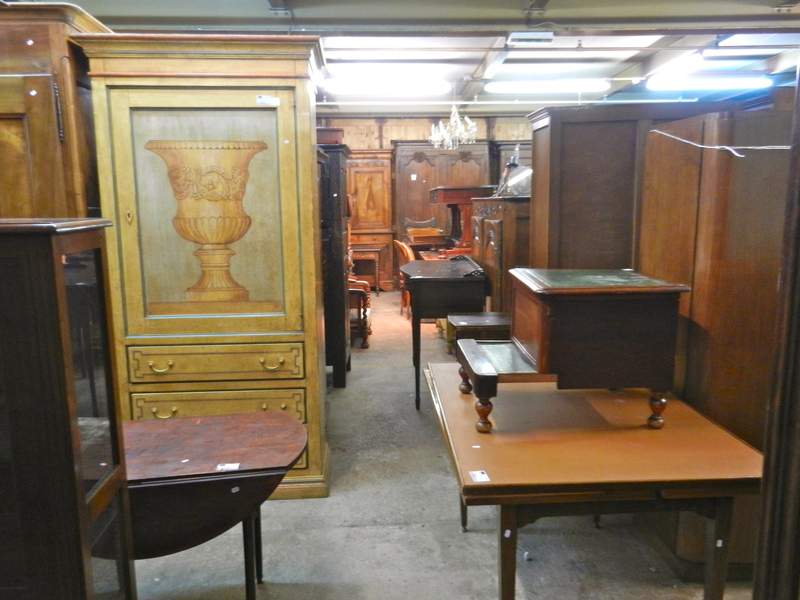 We browsed armoires with inlaid panels, angular Art Déco lamps, long rows of vases. Up creaking stairs, there were Oriental rugs, armchairs and a roomful of pianos. Lauren, a superb pianist, played while Rob and I sorted through a sea of tables. Hurrah! I spotted a wooden trunk, perfect for re-purposing as a creative coffee table. Concerned that my guests would arrive in two hours, I hurried to pay and leave. But Rob hadn’t finished. “Mom, what dishes will you use?” he asked. “Paper plates and plastic utensils,” I replied. His eyebrows rose to his hairline. “We need to do something more classy than that,” he declared. Lauren appeared beside him, nodding: “You need real china for your first party.” And they set off on an enthusiasm-fueled search. At first I fussed, worried about time. But as I watched his blond head and her dark one moving along shelves of dinnerware, I realized: This was what I had really wanted. Rob and Lauren cared about the apartment, and Paris. They were making the apartment ours. Lauren produced a green leather box of bone-handled knives. “These are just right,” she asserted enthusiastically. I imagined generations of hands that had worn the handles to a rich yellow patina, and nodded, grinning. Then Rob steered me to a mountain of vintage faïence*. Piled precariously on a tiny table were plates, serving bowls, even a mustard pot and an oval pickle dish, all decorated with roses, bluebells and tulips. With equal parts firmness and persuasion, he stated, “This set has everything you need, and it’s just your style. You should buy it.” Yes, it was perfect – especially because he had chosen it. At checkout, the manager explained that it would be logique* to deliver our purchases the next day, and laughed when I said, “Impossible. We’re using them tonight.” A bemused workman loaded the dishes into my fabric shopping cart, while I prayed its seams wouldn’t split. We grabbed a taxi, the driver making space for the trunk. In the back seat, Lauren and Rob cradled the cartful of breakables in their laps. Back home, I ran out for food while Rob and Lauren washed and organized. 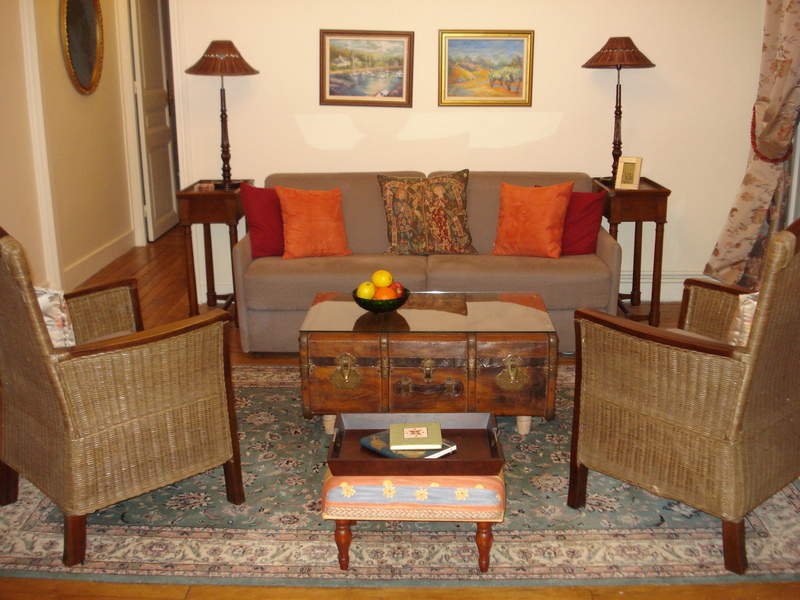 They set the trunk-now-coffee-table in front of the sofa and spread out the new serving pieces. We added bread, cheese, fruit, and chocolates. Tiny cornichons* looked great in the pickle dish. Guests arrived, happy to meet Rob and Lauren. They admired the dishes, and spread their pâté with the bone-handled knives. We toasted the apartment. And we didn’t care that our wine glasses were plastic, because now, it felt like home. 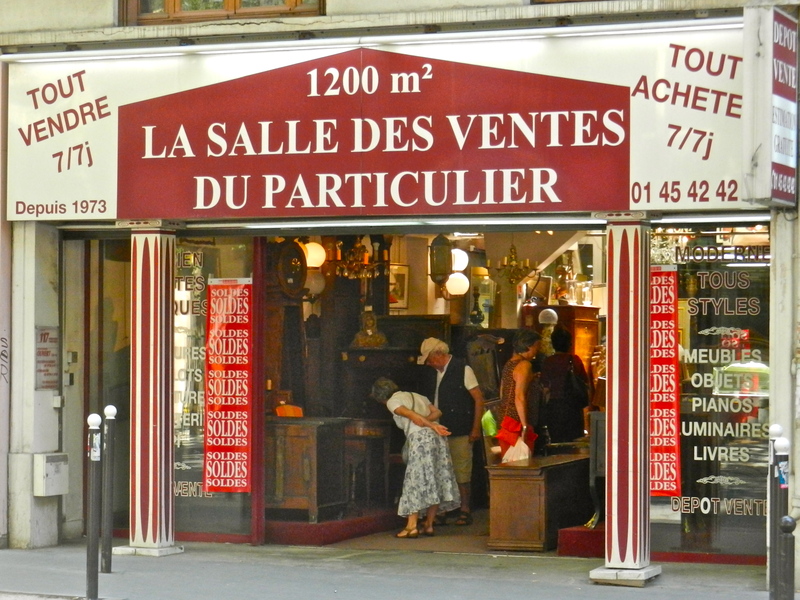 The Salle des Ventes du Particulier (literally, salesroom for individuals) was the first furniture consignment store in Paris. I learned later that it’s well-known to savvy decorators. Opened in 1973, the store is at 116 rue d’Alésia, 75014. The Marché aux Puces is actually a network of 14 markets – antiquarians, artisans, collectors, etc. – that together form the largest flea market in the world. It is at Métro Porte de Clignancourt in Saint-Ouen, a northern suburb of Paris. 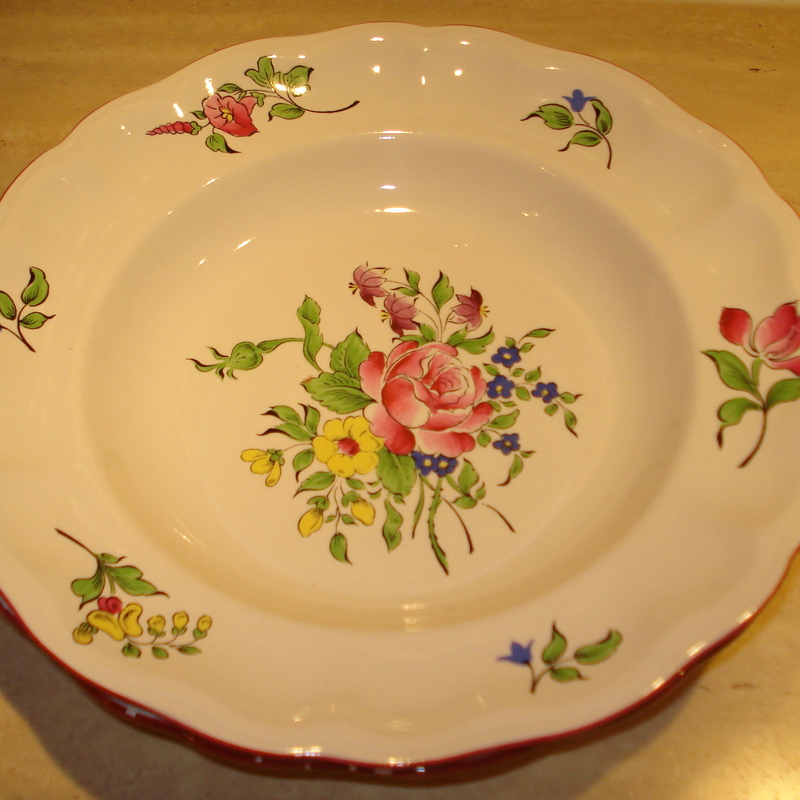 Réverbère is a pattern made by Lunéville, a classic French pottery manufacturer operating in Lorraine, France, since 1730. This pattern has been produced continuously since the late 1800s. The word réverbère also describes a style of firing and glazing, invented in the mid-19th century, that greatly enlarged the range and intensity of pottery colors. The living room as it looks today (with the same trunk). It was midnight in the Gâre de Lyon, and I was lost. Which was strange, since I thought I knew this train station well. It’s close to my apartment, my jumping-off point for trips south. 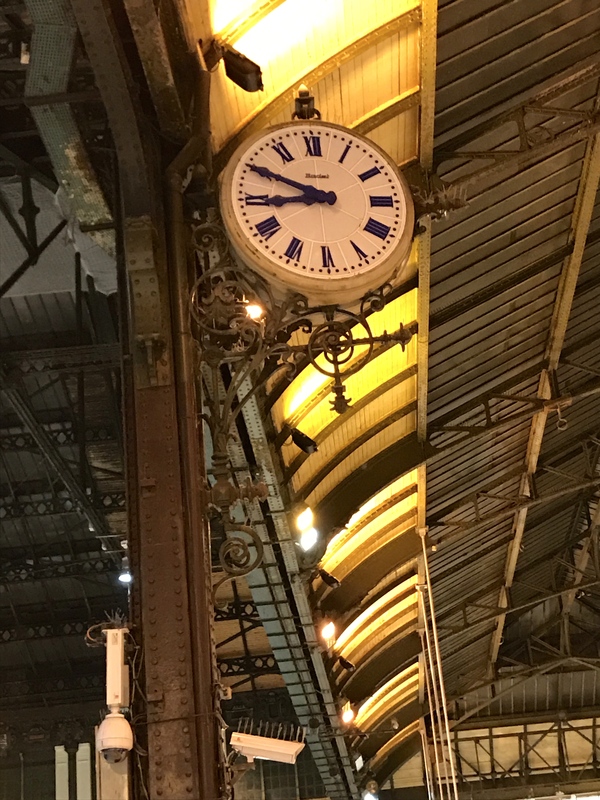 And it’s distinctive: The train hall, inaugurated in 1900, is full of forged steel, frescoes, grand arched windows and curving staircases. It’s usually crammed with travelers. But not tonight. After a late dinner in the suburbs, I had taken the RER (suburban train) back to the Gâre de Lyon. All I had to do was take several escalators up to the train hall, and walk home. 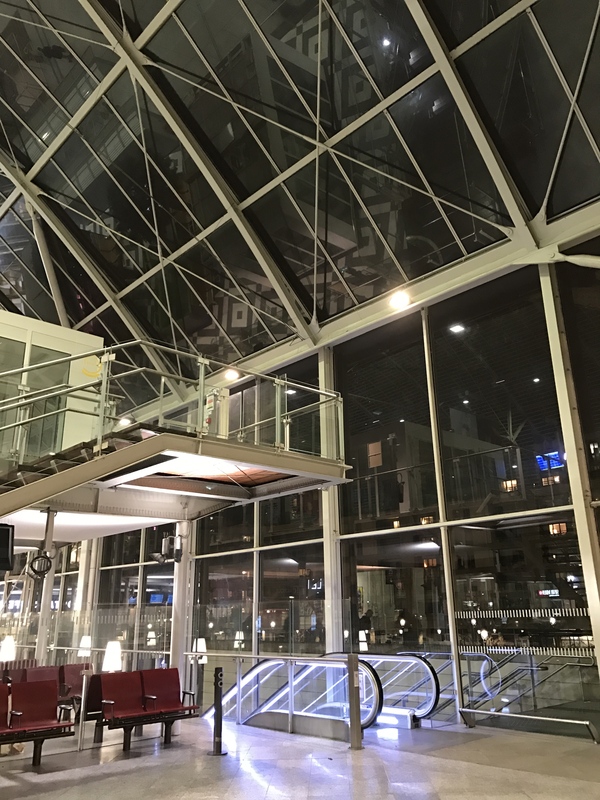 But when I got up to street level, I was not in the usual train hall – i was in a huge modern space entirely enclosed by glass windows and walls. 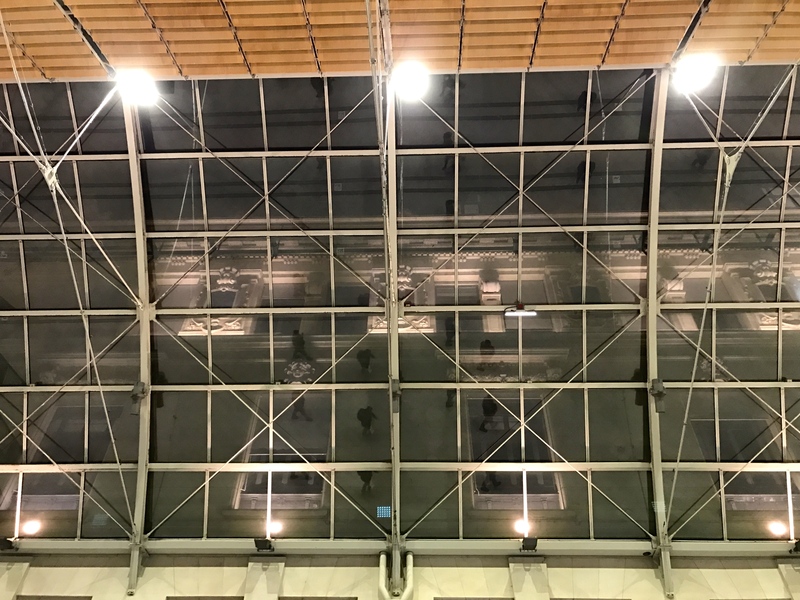 It was clearly a train station – empty tracks marched down one side – but I couldn’t get oriented: The world outside the windows was pitch black. The interior looked the same in all directions. 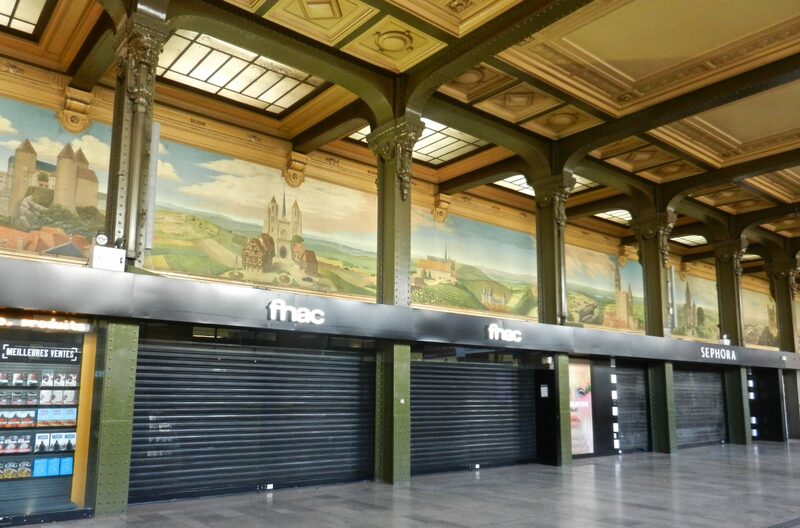 The station shops, a mini-Monoprix, tabac and pharmacy, were closed. Far above my head, empty office windows loomed. The only person in sight was a gentleman cleaning the floor in the distance. I felt like I was in a giant glass aquarium, with me the only fish.But not tonight. I was a bit anxious. Had I gotten off at the wrong stop? Taken the wrong escalators? I didn’t want to wander an empty building and unfamiliar streets at midnight lookng for my way home. Should I chase down the custodian to ask directions or just walk until I saw something familiar? I sat on a sleek metal bench, too tired to go exploring. Suddenly music filled the hall. This wasn’t piped-in music, it was real piano. Ragtime. I couldn’t see its source, and because of the echos, couldn’t identify its direction. But the music made me feel better, and curiosity got me up and moving. I set out to look for the piano, swimming in artificial yellow light from columns to kiosks to signs. At last, at the other end of the hall behind a large advertising poster, I found an upright piano. The young man at the bench was belting out 1920s Scott Joplin. There was no stage, no audience, no logic to this midnight performance. The pianist was dressed properly but simply, in khakis and a jacket. He had no sheet music, nothing but a shopping bag. His dark head moved with the music and he hummed as he worked his way through the early 20th century – blues, swing and lively French chansons. I stood listening. Finally a few people trickled by. A woman stopped to listen. A couple passed with backpacks. A family rushed through – mother, father, son, daughter, with a yellow Labrador retriever and two hockey sticks. From the direction the others walked, I discovered a corridor that led back to the old Gâre de Lyon, and easily found my way home. Later, I confirmed that I had taken the escalators to Hall 2, a 2014 ten-track addition to the Gâre de Lyon. Logically, I knew that some city authority must have approved and delivered the piano. But I preferred to believe that it had materialized just for the night, while the outside world slept, so I could listen to magical music in a giant glass aquarium. 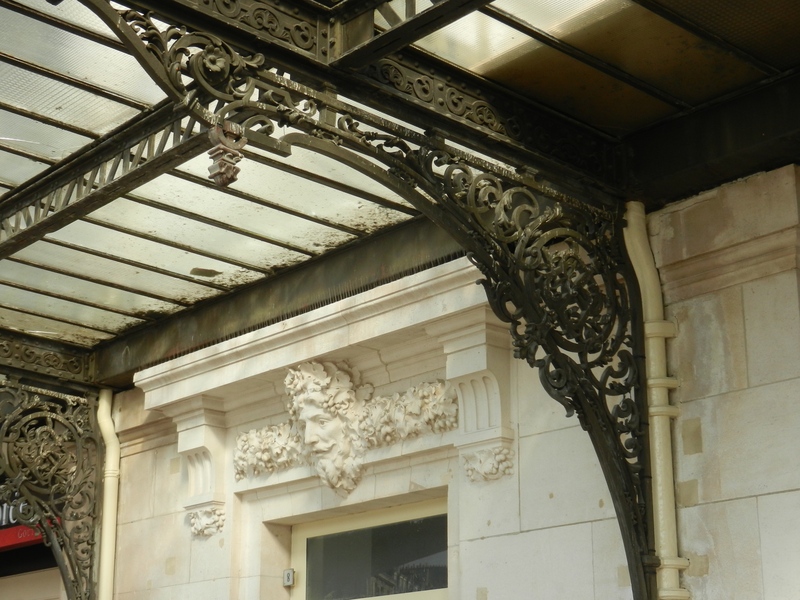 Here are some decorative bits from the old station. 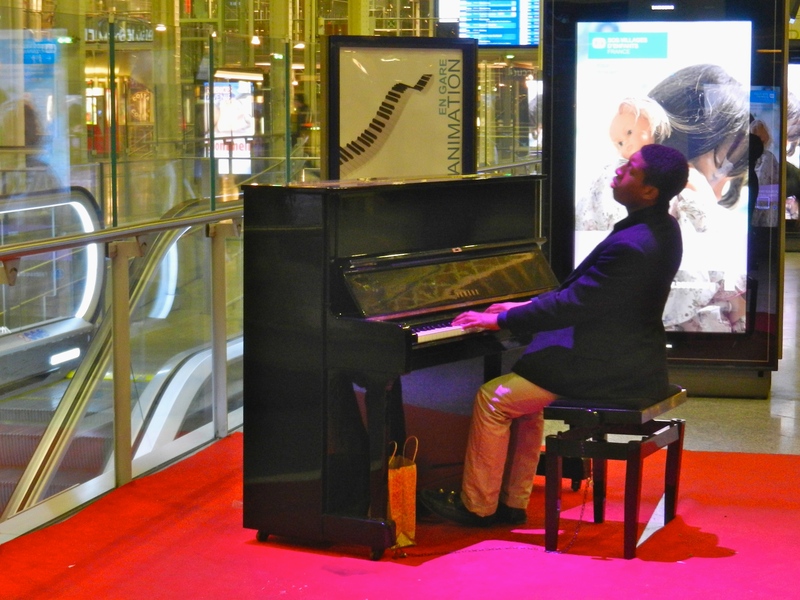 And here’s a map link to train stations with pianos. It was a grey, rainy evening in Paris, and I was at loose ends. No dinner plans, no evening events, and gloomy weather. I slogged along rue Mouffetard towards home, anticipating a solitary evening and feeling a bit sorry for myself. How to find fun and companionship with no friends around? The pedestrian market street was empty except for umbrella-toting locals and shopkeepers locking their stores for the night. At the end of the road, I passed a solitary café. Its warm lights spread a glow on the rainy cobblestones and illuminated its name, Verre à Pied, in block letters above the door. Big glass windows in the small green storefront showed a deep, narrow room with a wood-and-marble bar. And there was a handwritten sign in the window: Musique, mercredi soir, 21h. Music, Wednesday, 9:00 – just an hour from now. Here was the distraction I needed. I felt a little skittish about eating alone, but I was determined to take advantage of the opportunity. I pushed open the door. There was a short menu on the blackboard: Boeuf bourguignon sounded like the perfect French comfort food. I made my way to a table in back, sat near an old wood stove, and settled down to observe the entertainment. Patrons filled the small tables, chatting with the propriétaire tending the bar. A guitarist arrived and began to croon French ballads. The audience hummed along and requested songs. I especially noticed a group at the next table, a man and two women. They sang along with all the songs, even harmonizing. To my surprise, after a few songs the man stood and walked toward the guitarist, with applause from some of the diners. He was stooped, slightly disheveled and seemed tired. But when he reached the microphone, he straightened. He flipped up the collar of his leather jacket and greeted the crowd. Then he launched into a romantic, dramatic interpretation of La Mer, a Charles Trenet love song. The audience whistled and clapped, and he returned to his friends at the table. Other volunteer performers followed. Then the guitarist seguéd into the Beatles. Being American, I knew all the words, and couldn’t resist singing along from my seat. The trio next to me moved their chairs closer, enthusiastically complimenting my singing and incorporating me into their conversation. We introduced ourselves – Serge, the singer, had a local reputation as an interpreter of French classics. Sylvie, retired from civil service, was an active local volunteer. Jocelyne, sociable and curious about the US, was visiting from the suburbs. Collectively, they decided that I must perform too! Yikes. It seemed like a big step from a quiet dinner alone to belting out Beatles for an audience. But before I even knew I’d said yes, I was at the microphone singing “I Want to Hold Your Hand”, then “Yesterday”, topped by a rousing sing-along of “Let It Be”. When the singing ended, Sylvie squeezed all four of us into her tiny Citroën, and drove to her nearby apartment. 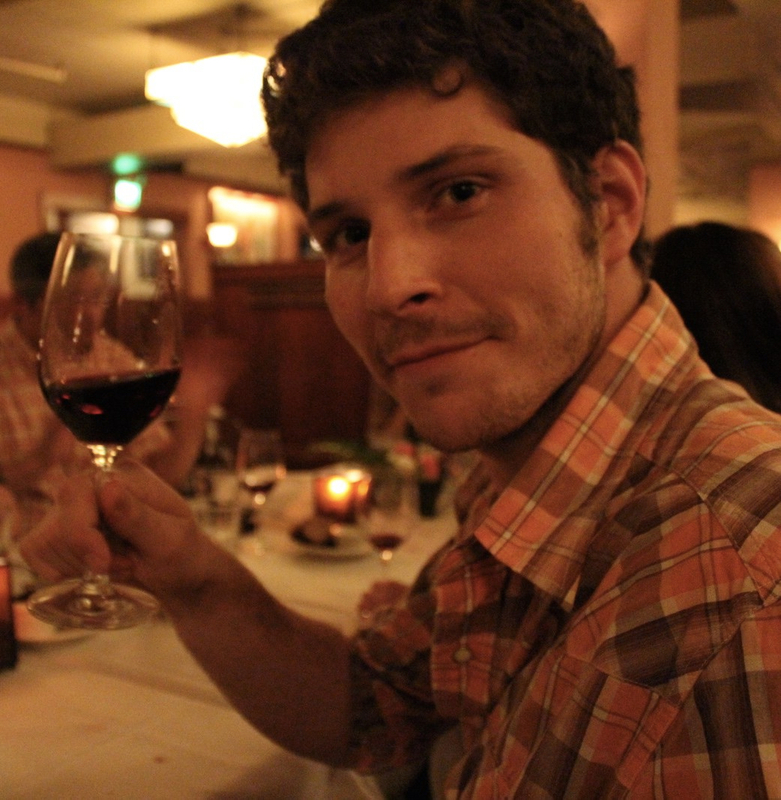 Over a bottle of wine, we talked politics, health care and academics. I learned that Serge looked tired because of a recent heart operation – “But I don’t feel tired when I sing,” he explained. They welcomed me to the neighborhood, “Le quartier le plus sympa de Paris”*. Then we piled into the car again, and they delivered me to my apartment in a warm rush of international good feeling. It took me days to absorb this sudden encounter with new friends and fun. How had it happened? Partly, good luck. I couldn’t expect to be welcomed spontaneously every night. But that evening reminded me that determination and a little risk-taking frequently pay off. In fact, they’re essential to living well as a part-time Parisian. 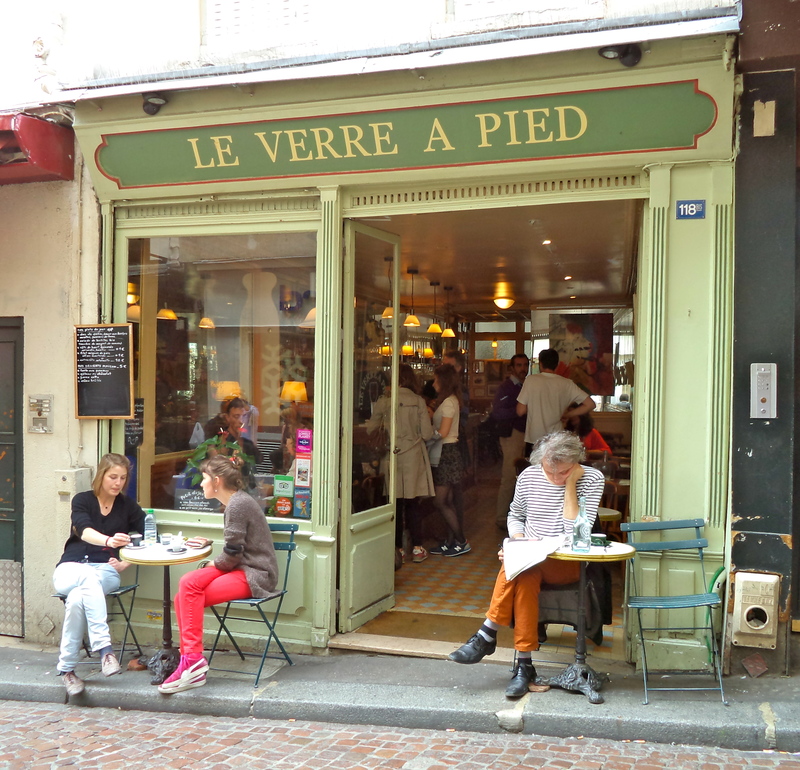 Since this event, I’ve been back to Le Verre à Pied (The Wine Glass) several times, and learned that it has been in operation since the 1930s. 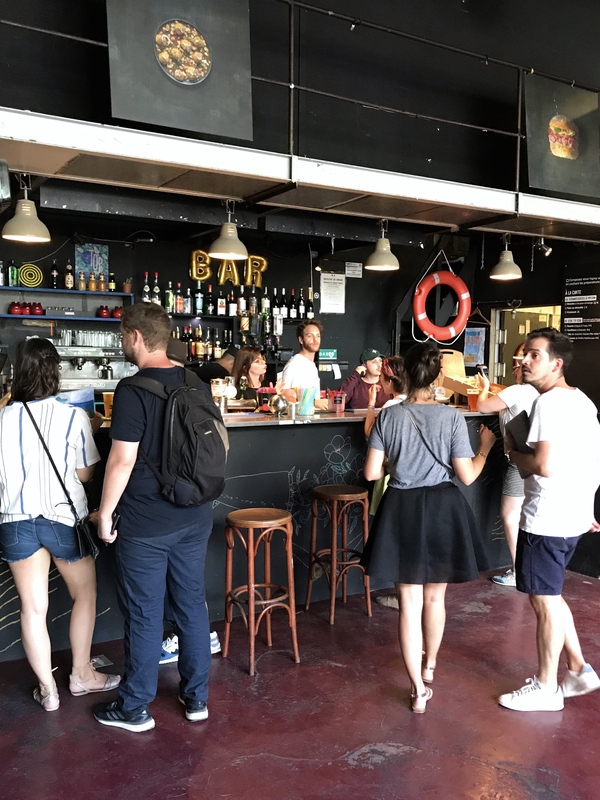 It has kept its authenticity despite having been featured in the movie Amélie, and attracts a loyal clientele of residents, students and families. There are art exhibits on the walls and a pile of books on the old stove for relaxing with wine or coffee. Go early – it’s only open 9:00 to 9:00 (4:00pm Sundays). It no longer hosts music nights but the food, fait maison (home-made), is terrific. Le Verre à Pied, 118 bis rue Mouffetard 75005, 01 43 31 15 72. Charles Trenet was a French singer/songwriter active from the late 1930s to mid-1950s. Americans know La Mer, the song Serge sang, as Bobby Darin’s Somewhere Beyond the Sea. I’m at Café O’Jules on the Place d’Italie, accompanied by a large brown box and a serious case of exhaustion. Whupped isn’t a French word, but it’s the best one for how I feel. How did I end up here, listening to a French version of “Born to Run” and eating stale popcorn out of a plastic basket? I looked around. Nothing here resembled the Chinatowns of San Francisco or New York. No arched gateways, no winding streets, no quaint lanterns. 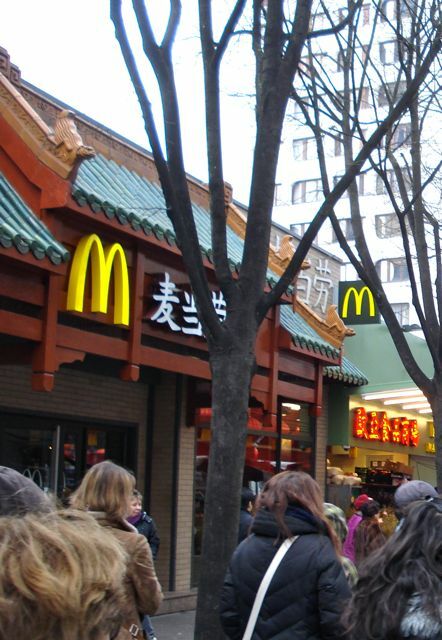 The closest thing to an ethnic restaurant nearby was a McDonalds with Chinese lettering. All around were enormous featureless towers. Marti seemed to anticipate my reaction – “This Chinatown must be discovered and uncovered,” he said. “It is a creation of the last 40 years.” I hope it’s here somewhere, I thought, because this is the blandest neighborhood I’ve seen in Paris. I was wrong. The Asiatic Quarter is a rich and fascinating district camouflaged by modernistic apartment blocks. In the 1960s, a massive urbanization project replaced an “insalubre” workers’ district with dozens of residential towers. Influenced by Le Corbusier’s principles, planners ignored traditional French street life, elevating pedestrian areas onto platforms above street level. This design repelled the Parisian professionals who were the intended residents. Many developments were close to failure when, in the 1970s, immigrants fleeing war in Southeast Asia began to fill the empty towers. 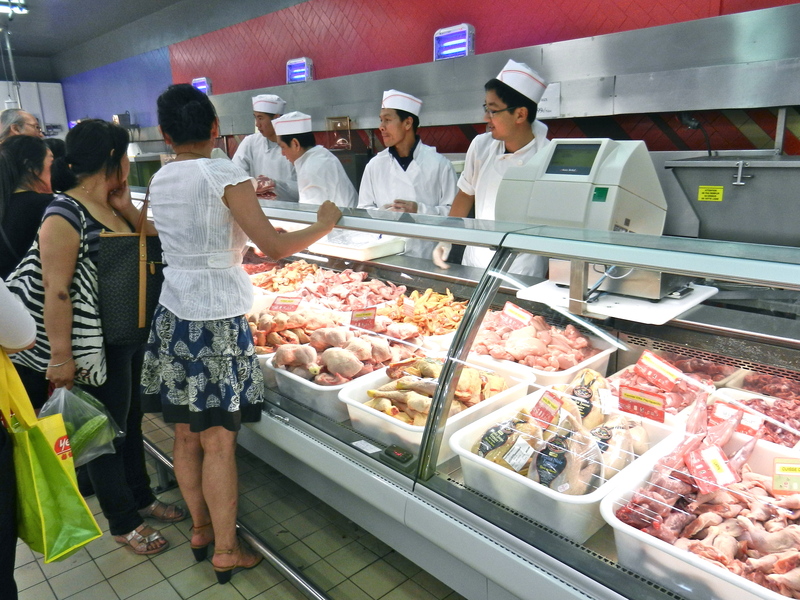 Today, la petite Asie includes 200 acres and 50,000 Vietnamese, Cambodian, Lao and Chinese. The high-rise design hides much of the life of the quartier asiatique from the casual stroller. 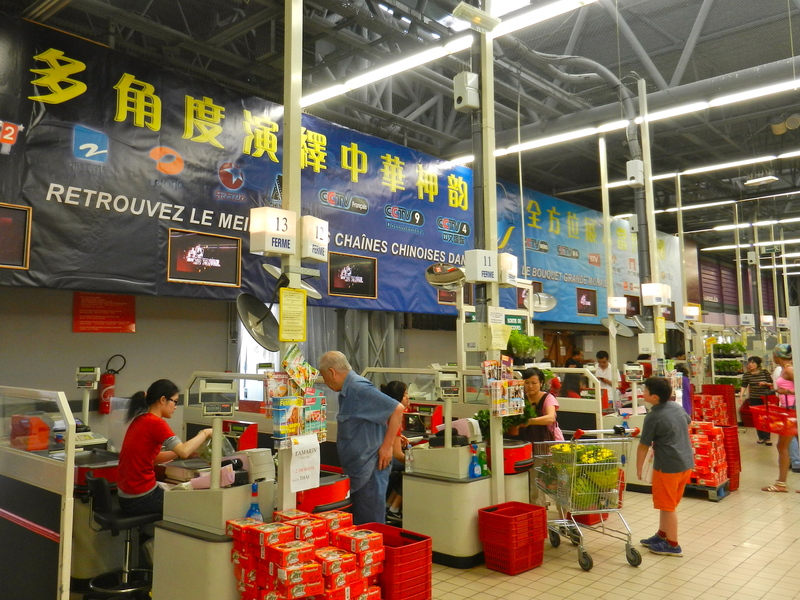 For example, to enter Tang Frères, giant retail flagship of a family empire, we walked down a sloping driveway, around a corner and under a building. But once inside, it seemed that everyone in Chinatown was there, buying rice noodles, lychee juice, coconut milk, octopus – anything edible and Asian. A Buddhist temple is tucked in a far corner of the dalle. Around more corners and up a stairway, we stepped out onto the dalle, the elevated pedestrian platform of Olympia, largest of the developments. Its pagoda-style shops are far removed from street level – 30 feet above it. But children played soccer on the open concrete porch; and tucked in a corner of the platform was the temple of the Buddhist Teochew sect, with a welcoming feel and brightly-decorated community room. Then we descended several flights of stairs for another stop – this time a temple whose entry is in the ramp to a parking garage. Will I muster the energy to walk to the taxi? Or will I continue to sit here, dreaming of mysterious Chinatown, falling asleep over my glass of Dubonnet? Ask me later. Right now, I’m whupped. “Bienvenue au quartier asiatique, le Chinatown de Paris.” – Welcome to the Asiatic quarter, Paris’ Chinatown. 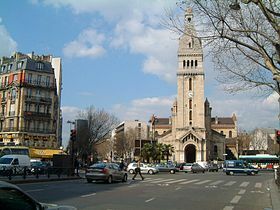 This district is bordered by avenue de Choisy, avenue d’Ivry and boulevard de Masséna. Wikipedia has a good account of the 60s project to remake the area. 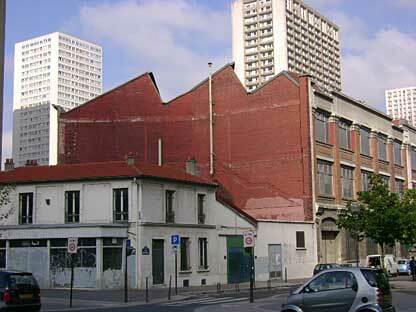 Look for the 1891 Panhard buildings, remnants of demolished factories. 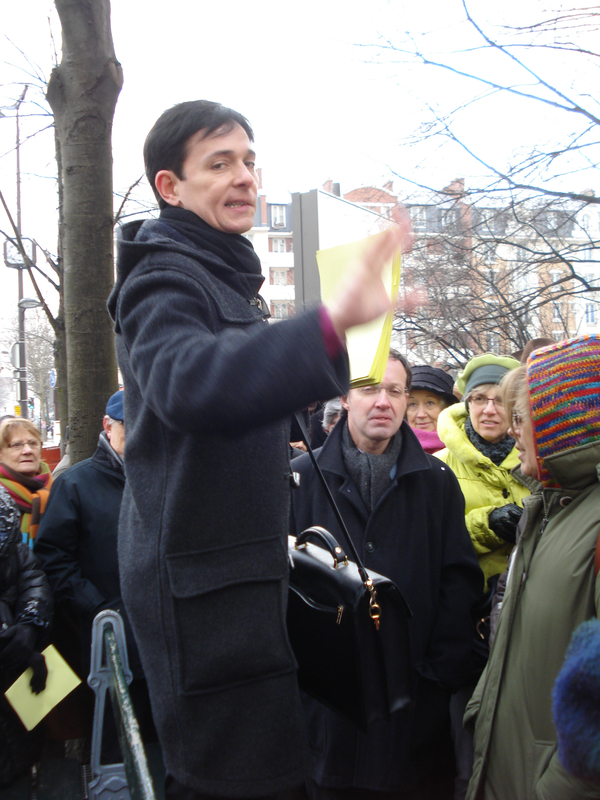 Claude Marti, our guide in Chinatown, is a rock star among French-speaking Paris tour leaders. Tang Frères, 48 Avenue d’Ivry, 75013, sells to cooks and restauranteurs from all over Paris. Temple de l’Amicale des Teochew, Terrasse des Olympiades, offers a quiet retreat, and the Association des Résidents en France d’Origine Indochinoise hosts public events. Café O’Jules, 2 Rue Bobillot, 75013, redeems itself on quiet Sunday afternoons, with comfortable red chairs, dark wood décor – and peanuts instead of popcorn. When most people think of views over Paris, they think of the thousand-foot Eiffel Tower, or the top of Montmartre. I beg to differ. My favorite perspectives are the ones I get from about twenty feet in the air. At this level, invisible to those below, I see the detail of life on the street, plus sights not available at ground level. How to get this point of view? My favorites are the elevated walkway of the Promenade Plantée, and L’OpenTour, a hop-on-hop-off double decker bus line. The Promenade Plantée (officially, Coulée Verte René Dumont) is a re-purposed elevated rail line, the inspiration for New York’s High Line. Built in 1859, abandoned in 1969, the line was saved from demolition in the 1990s by citizens inspired by its architecture. I discovered it by accident a few years ago when I tried to circle the Opéra Bastille building. There was no way around: The south side of the Opéra building merged into a row of brick arches with an inconspicuous staircase on the left. If I hadn’t seen a few people ascending, I never would have climbed it. The Promenade is on top of these arches. At the top of the stairs, a landscaped path extended into the distance. I followed it along rose-covered arches, bamboo groves and water pools. 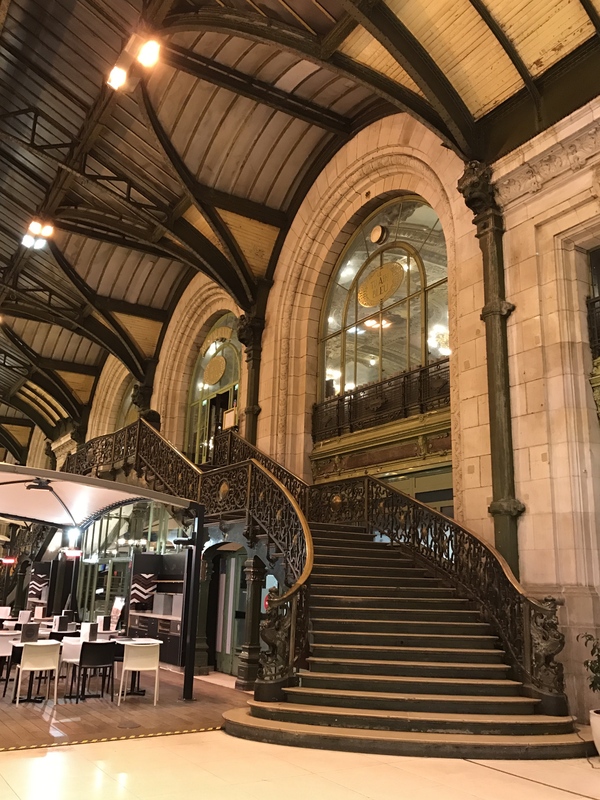 Looking over the side, I watched as, unawares, people chatted in cafés, drivers made their way to the nearby Gâre de Lyon, and cyclists wove among them. 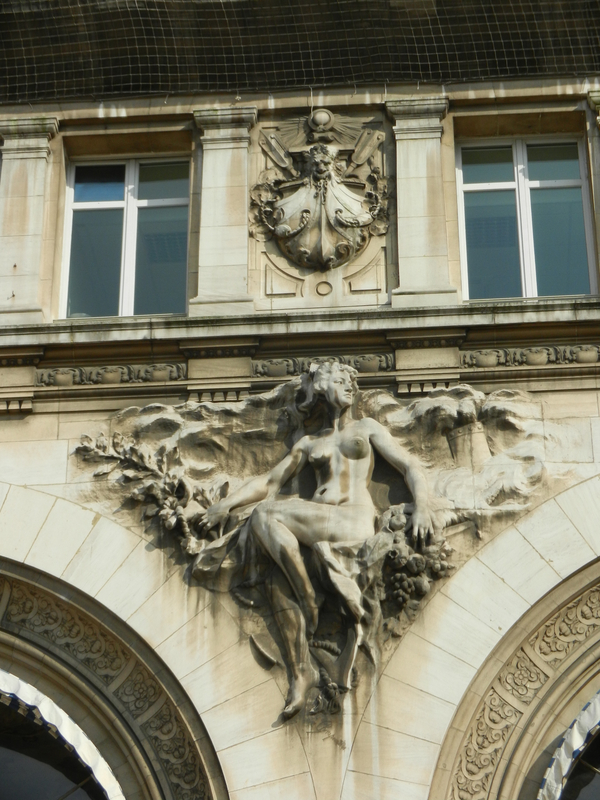 I saw surprising architectural details, too, like the sculptures along the roofline of the Hôtel de Police, or the place where the Promenade cuts right through an apartment building. 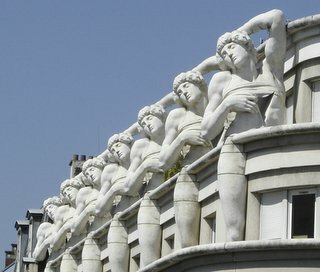 Replicas of Michelangelo’s Dying Slave pose on top of police headquarters. The variety of people, foliage and weather, and the multiple exits, make every walk different. 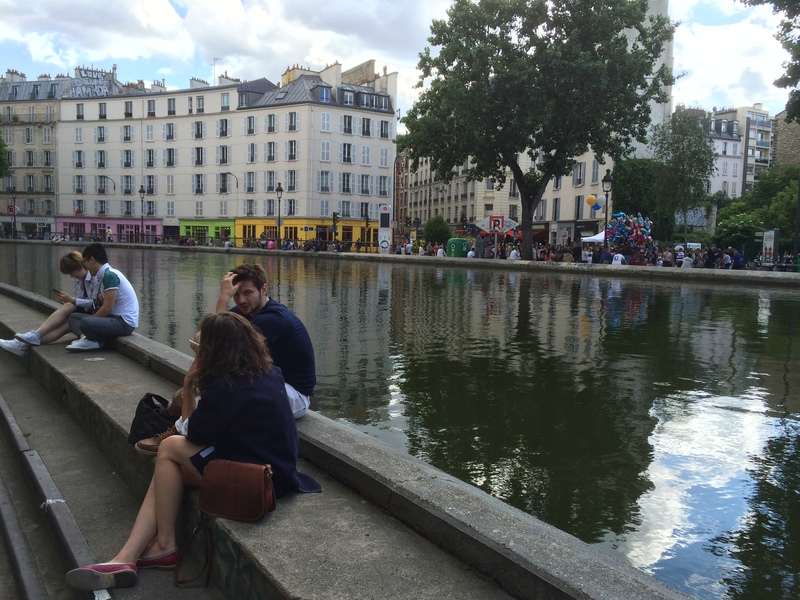 In a different vein – if you want to sit down while overlooking Paris, L’OpenTour is the way to do it. 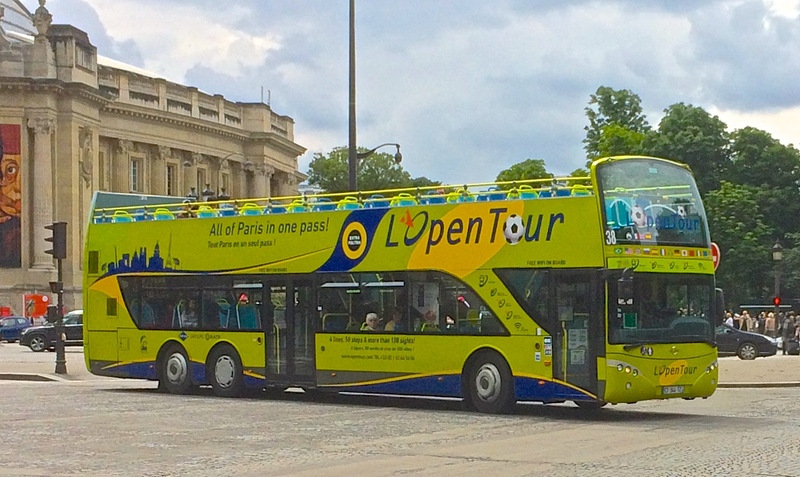 Generally, I hate bus tours; I took L’OpenTour because its bright yellow buses made me curious. It was simple: I got on at the stop nearest to my apartment, bought a ticket and picked a seat on the open top. Suddenly, monumental Paris came closer to human scale. 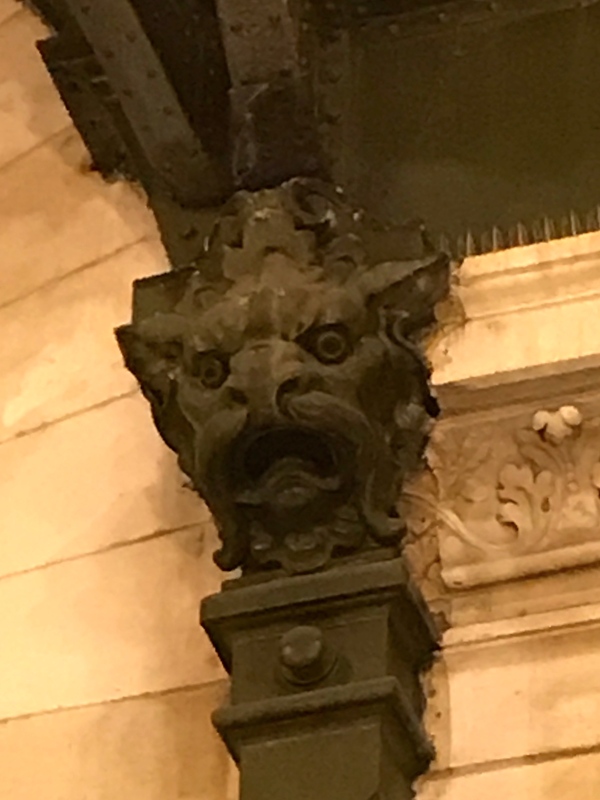 I could see the sculptural detail on the Arc de Triomphe, look into the face of the lion statue at Place Denfert-Rochereau, and watch workmen on the sides of buildings. L’OpenTour has no human guides – riders are outfitted with individual ear buds that plug into jacks at each seat. Its commentary has eight language choices, with depth, attitude, and even songs. My friends listened to the action-filled children’s commentary, hosted by pirates, street urchins and princesses. “It’s a hoot,” said Haley. “Did the adult version have the story about the dead cat?” (Nope!) And what fun it was to peek in upstairs windows. For me, the magic of L’OpenTour and the Promenade Plantée is the air of invisibility – I’m in the fourth dimension, a clandestine observer of street life: A woman ogles a handsome man; a beggar makes a rude gesture behind a shopper’s back; a workman furtively sneaks a cigarette. And once in a while someone looks up, spots me watching, and waves hello. 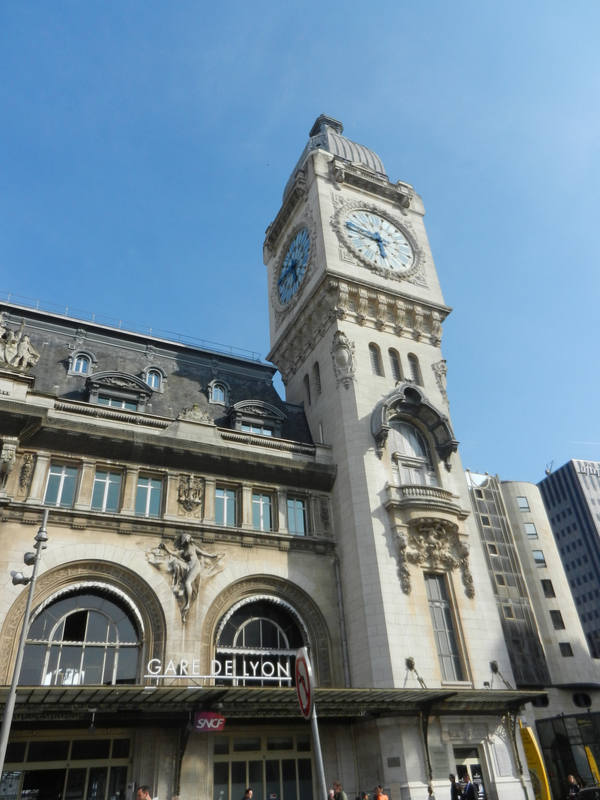 OpenTour Paris has four routes that go to famous and lesser-known sites. It’s good for first-day orientation or more in-depth touring. Some travelers find the lack of a live leader disconcerting, but I love it because I can control my own experience. The cost is 33 euros per day, with children’s and multi-day discounts. For the “above Paris” experience, go on a sunny day and sit on top. John and Haley like the top of the bus ! Promenade Plantée is just off the Place de la Bastille. 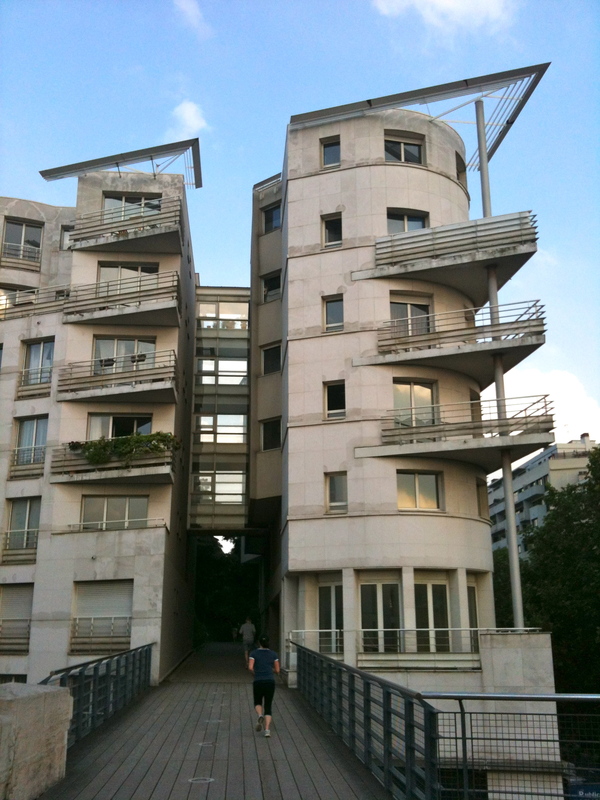 Follow the rue de Lyon on the right of the 1980s Opéra Bastille, to its intersection with avenue Daumesnil. Climb the stair on the left. You can take a short stroll or walk all 4.7 kilometers to the Bois de Vincennes. 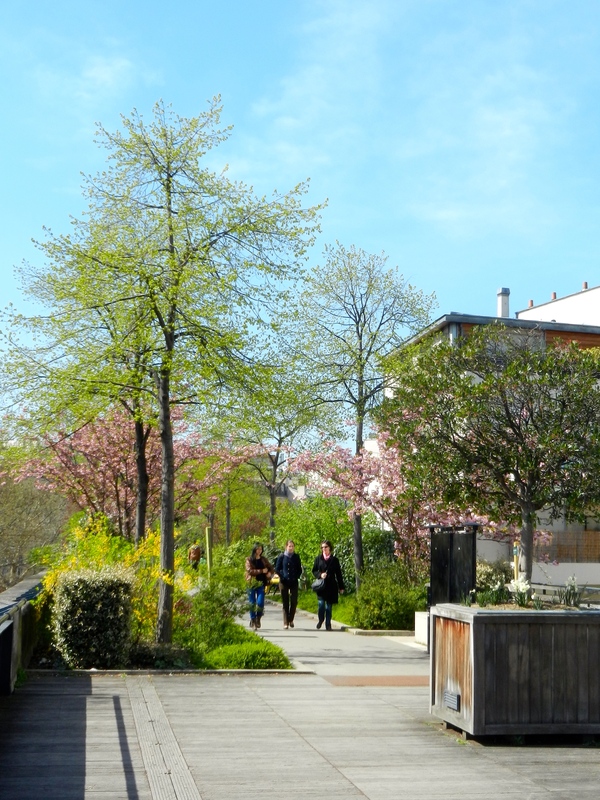 When you’re done, descend and return at street level, along the Viaduc des Arts. These 71 brick arcades that support the Promenade contain workshops for artisans of the performing arts – costumers, instrument makers etc. This photo shows the unobtrusive entry to the Promenade. There is a big sign for the Viaduc des Arts, but just tiny ones for the upstairs walk. As I sat in Place de la Contrescarpe one September afternoon, a group of young people, all dressed in pink, streamed purposefully up the street past me. I seemed to be the only person in the café who paid attention to them – had the locals seen this before? Nearly every day, Paris presents me with a new mystery. I love encountering events I don’t understand – each one is a puzzle to be solved, another chance to master a new fact or an old tradition. Ah-ha! I thought. I want to figure out what these pink-clad people are up to. 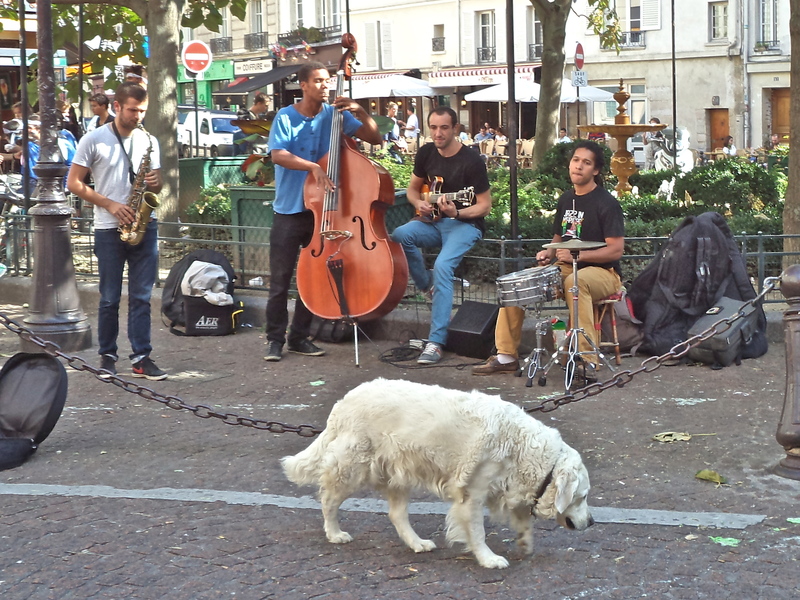 The Place de la Contrescarpe is near the Sorbonne, so I assumed that the roving band must be students. When they stopped in the middle of the square, I walked to the front of the café for a better view. A waiter and waitress stood nearby, one eye on the group and one eye on their customers. “What’s going on?” I asked. “It’s bizutage,” said the waitress with a frown, nodding in the direction of the students. “This is the first week of university. They do this every year.” Then she peeled off to attend to a new customer. Beezootage? Bisoutage? Bizutage? What’s that? How do you spell it? Why did the waitress seem disapproving? 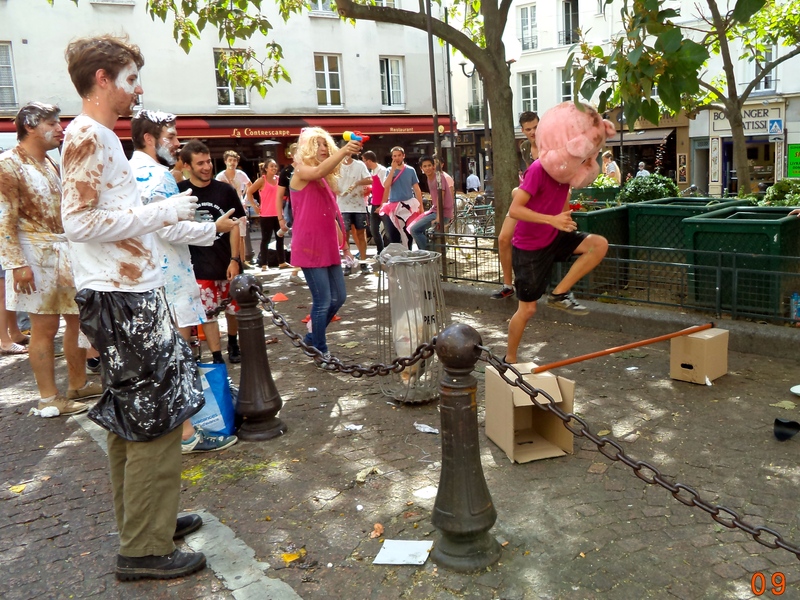 Getting closer to the students, I saw that they had launched a strange relay race, with participants wearing outlandish animal heads. The race involved crutches, water guns, a makeshift obstacle course and enthusiastic teasing from the rest of the team. Before I could ask about the rules – if there were any – the game ended. The pink troop took a group picture and walked briskly out of the square. 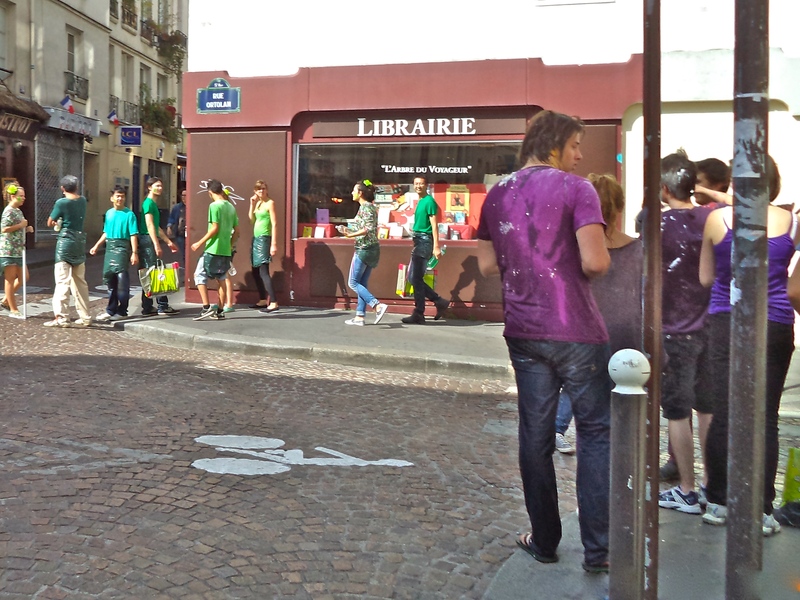 Other color-coordinated teams in white, black and green took their place in front of the cafés. Good-natured taunts ensued, and skirmishes with buckets of water. 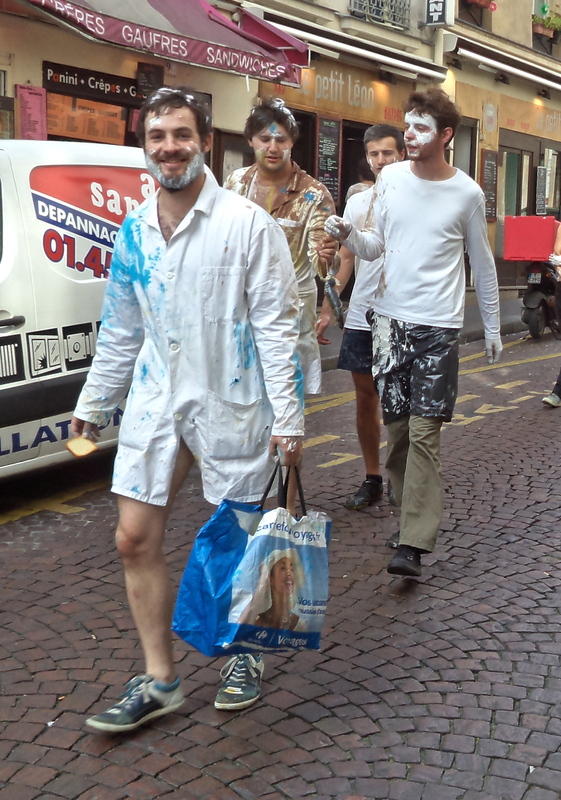 This White Team member carried a bag of snacks – and smiled at the photographer. The adventure continued: All afternoon, around the neighborhood, I ran into more roving bands. Their shenanigans seemed to be innocent back-to-school hijinks. 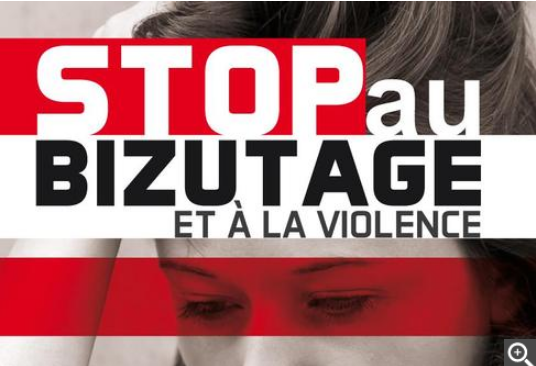 But later, when I told our building gardienne that I had watched bizutage, her reaction was unsmiling and solemn. I thought I must have been unclear, so I laughingly described the dress and activities. She looked puzzled, and said, “These activities have been a big problem.” Now, I was confused. The Purple Team checks out the Green Team. Moments after this picture, the two groups were chatting sociably. My American friends were also clueless. “Bizutage sounds like bisous (kisses),” Eliza said. “Does it have something to do with love?” Finally my French friend Marie-Claude explained the negative reactions. Bizutage means hazing. * Some French schools and professional organizations have a history of degrading, dangerous initiation rites. Acknowledgement of these practices has come slowly. Despite a law making hazing illegal, scandals and deaths have continued, involving medical schools, secondary schools, firemen and the national aviation school. Many organizations now have formal campaigns against hazing. The exploits that I saw were a non-toxic version of bizutage, substituting humorous pranks or athletic challenges for more poisonous activities. But some hazing has just moved to off-site “integration weekends” or gone underground. * Bizutage comes from the slang word bizut, for freshman or novice. 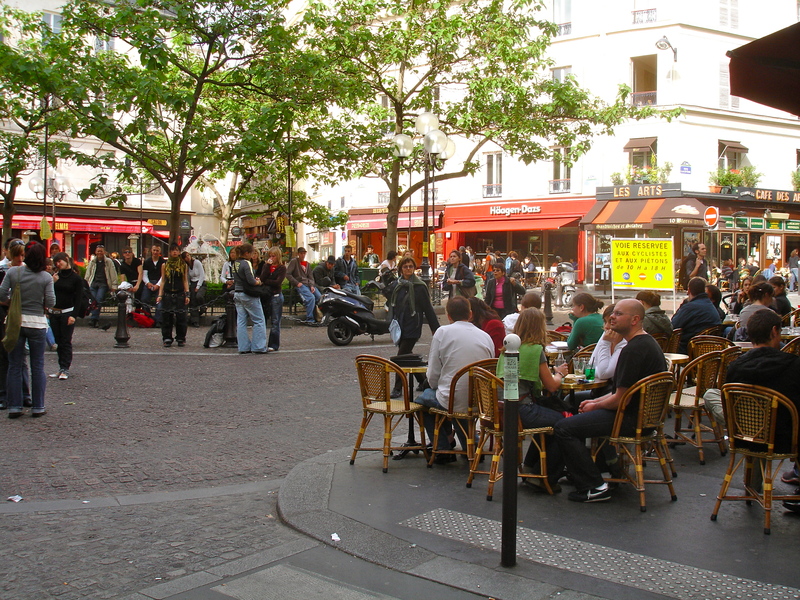 Place de la Contrescarpe is a leafy square, surrounded by cafés, at the north end of rue Mouffetard in the Fifth arrondissement. Lingering over coffee or wine, you may see street performers, neighborhood fairs or even masseurs and masseuses, who give back rubs on chairs under the trees. 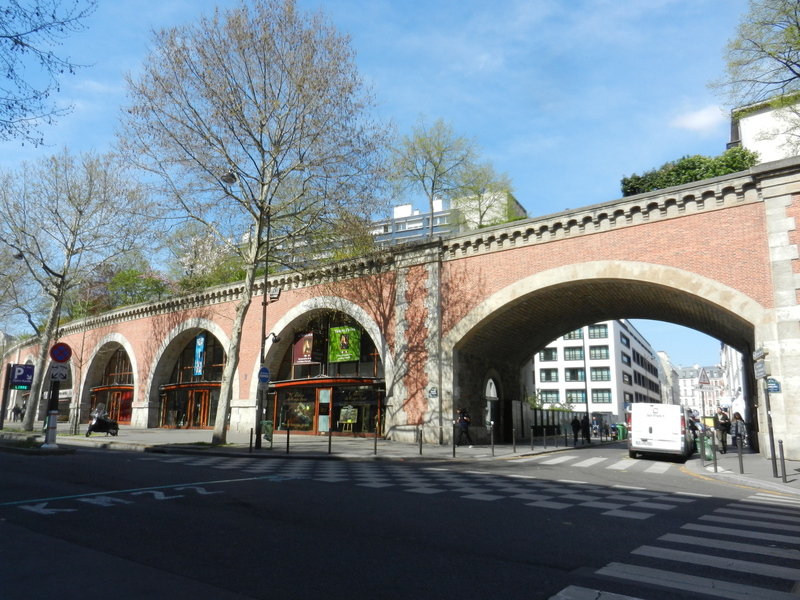 Place Monge, nearby, is the location of the Monge market, since 1921 a neighborhood treasure. it’s held Wednesday, Friday and Sunday. 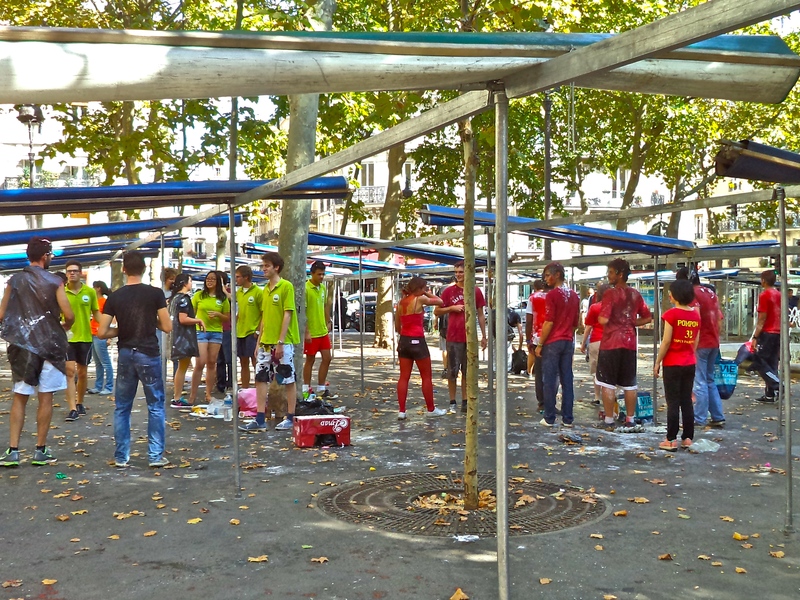 Blacks, Reds and Chartreuses hold a water fight under the scaffolding for the Place Monge market. 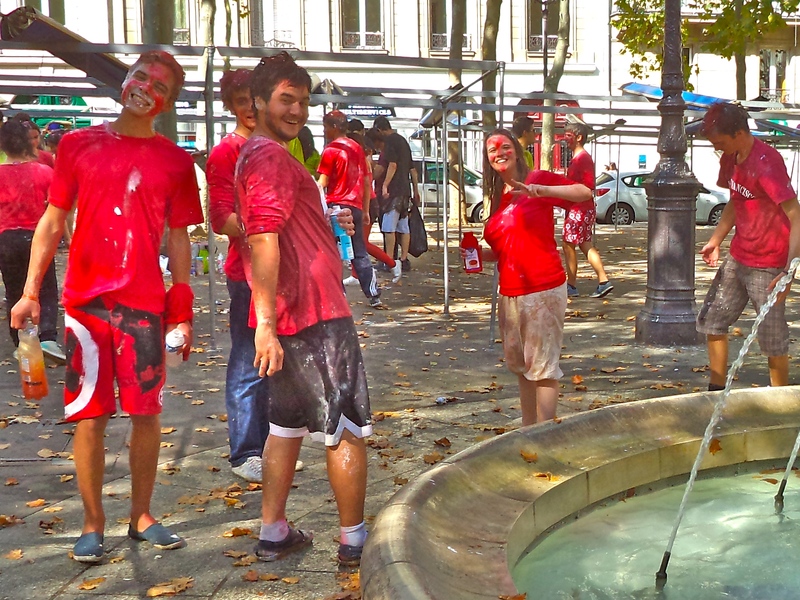 The Reds, claiming a win, refill their bottles in the fountain. I’m in Paris for just one week, the first week in September. It’s a great time to be here, for two reasons: The weather is perfect. And, it’s La Rentrée. La Rentrée means The Return – literally la rentrée scolaire, when students and teachers go back to school. But because many businesses close in August and much of the population takes vacation, La Rentrée is also associated with a general restart of activity. There are expositions, performances, advertising promotions, sports events and theater offerings: “La Rentrée Cinéma” “Spectacles de la Rentrée” “Rentrée Yoga” – even a Rentrée special on galvanized nails. There’s also a general air of anticipation – what will the new year bring? 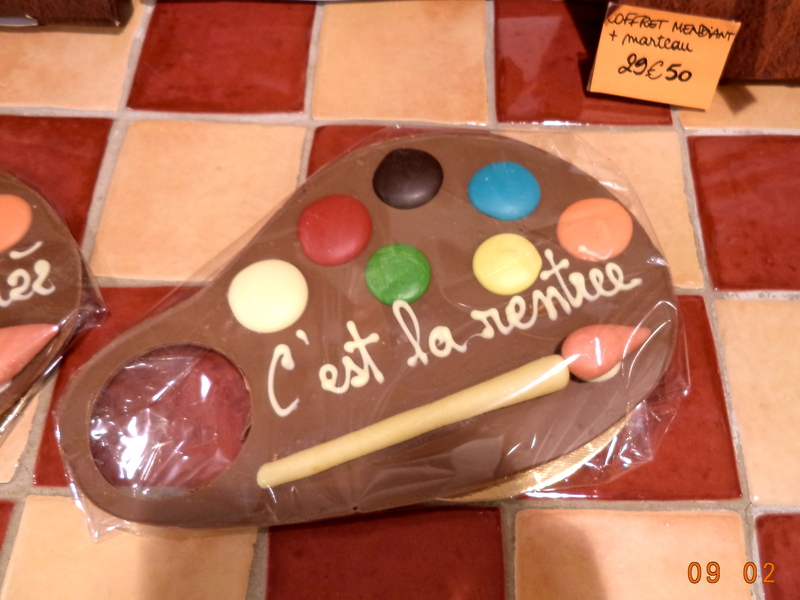 Nicolsen, my favorite chocolatier on the rue Mouffetard, created a chocolate palette for La Rentrée. Nicolsen has four small shops and manufactures in a workshop north of Paris. 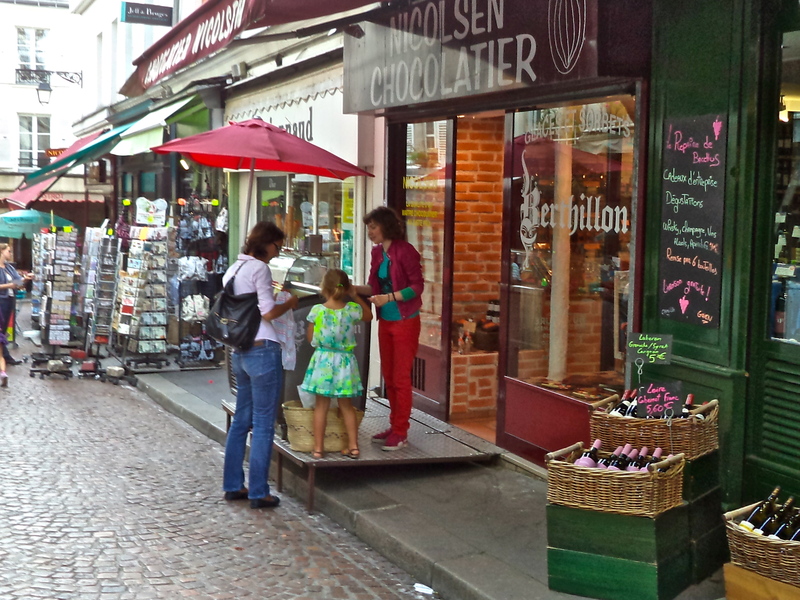 Its chocolates don’t show up in gourmet Top Ten lists, but they are yummy, and the locals shop here. A young student is rewarded with ice cream from Nicolsen after her first day of school. 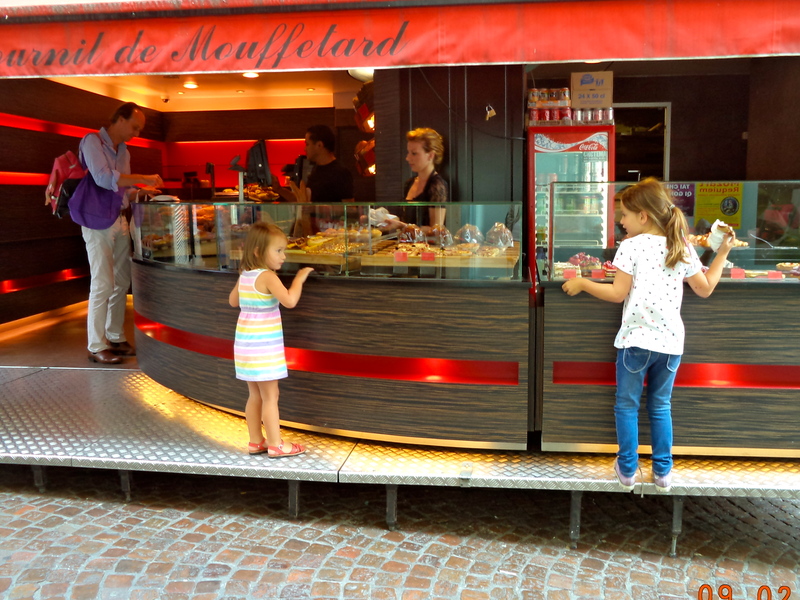 While their father shops at Fournil de Mouffetard, his daughters tightrope along the narrow bakery platform. The metal floor and pastry cases are unfolded every morning; immediately a long line forms. Right after this picture, I bought a grain-encrusted baguette hot from the oven. Mmmmm. 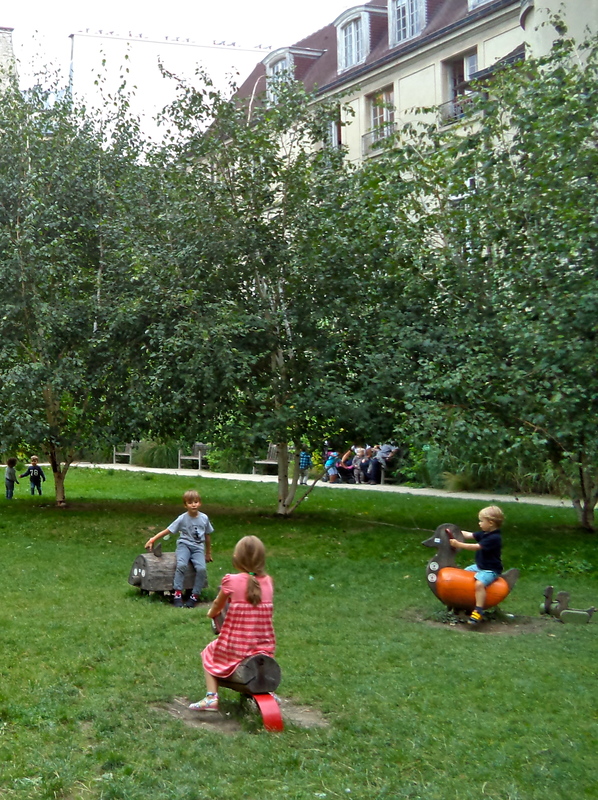 A friend took me to this newly-opened park on the rue des Rosiers. 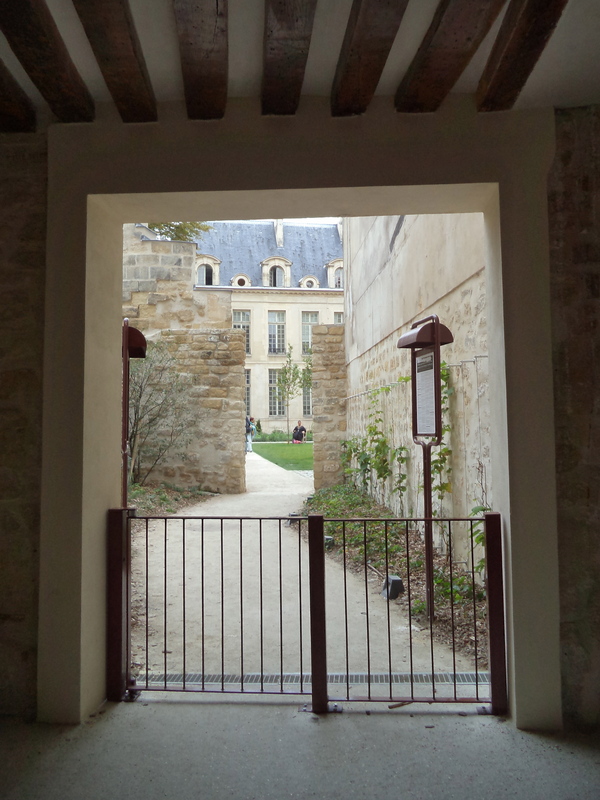 It’s tucked behind buildings; its entry is through the twelfth-century Philippe Auguste city wall. The park, in the old Jewish quarter, is named for Joseph Migneret. To me, that feels like a poignant choice. He rescued children during the Deportation. For the adults, it’s clean-up-fix-up time. 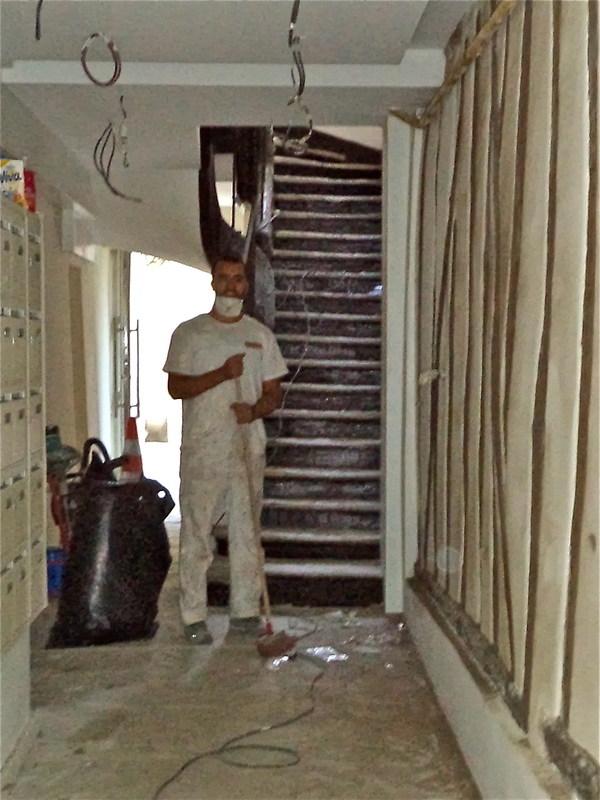 This workman posed beside his newly-whitewashed wall in the Passages des Patriarches. 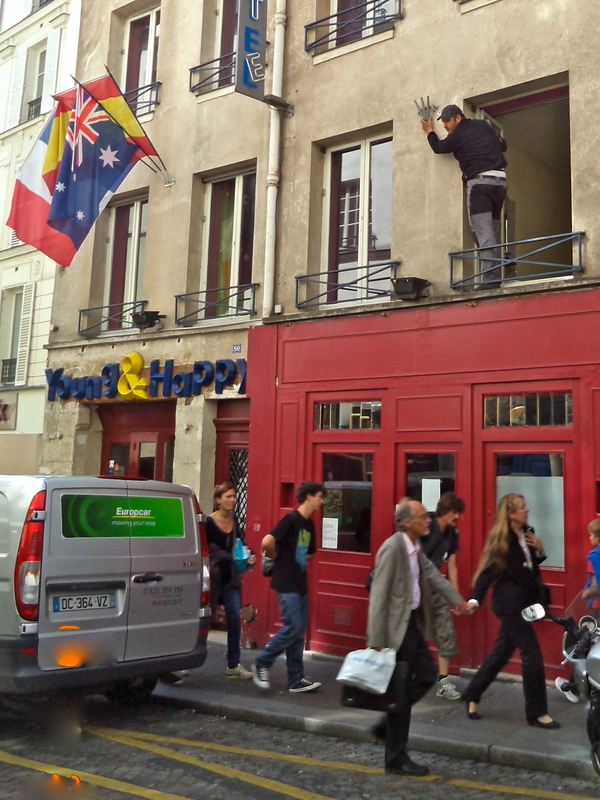 This guy leaning out of a second-floor window is installing flag holders for Young and Happy, a youth hostel. 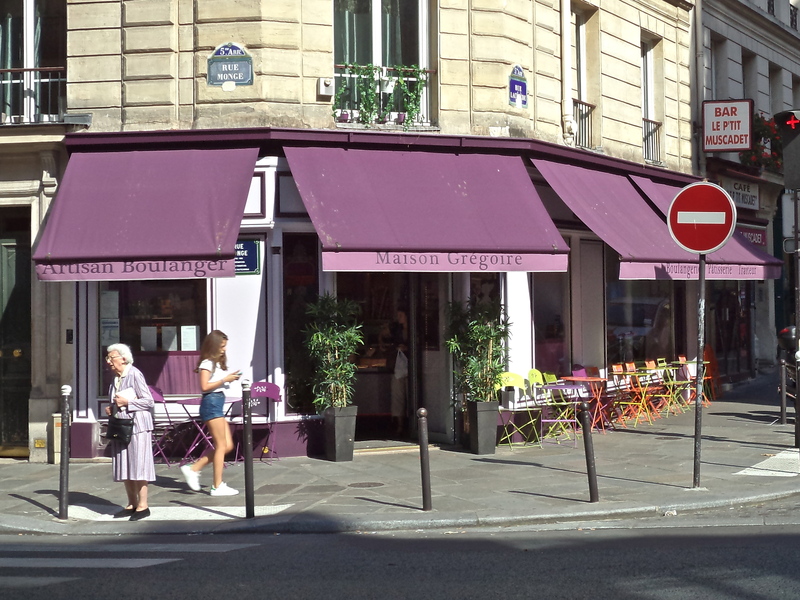 Maison Gregoire, around the corner from my apartment, has hung a new purple awning and set out multicolored tables and chairs. Today a lovely lady in a purple suit adds a decorative touch. There is plenty of room for performers and pets on the Place Contrescarpe. Usually the square is crowded, but this week the tourists are gone. So it’s easy to find a seat in the cafés, and you can hear the notes and the splashing of the fountain. 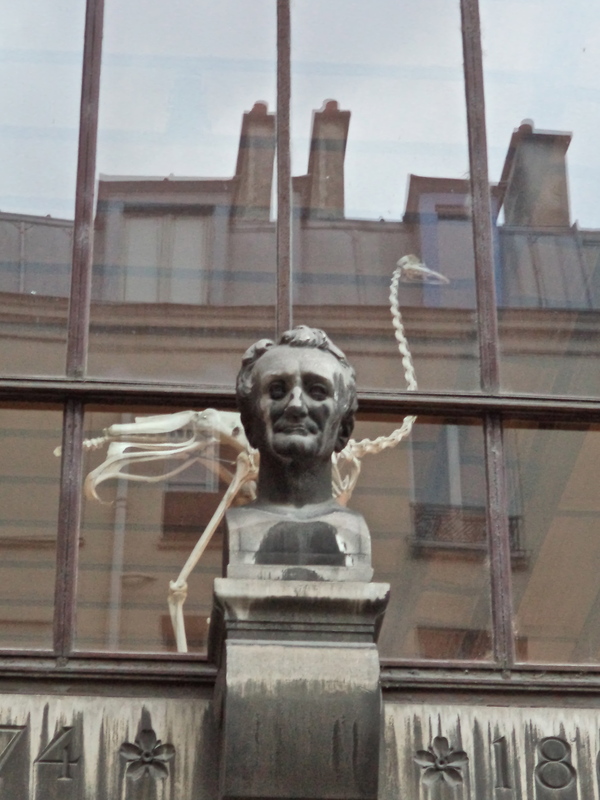 André Marie Constant Dumécil, zoologist, looks down from the wall of the Museum of Comparative Anatomy and Zoology and seems pleased with La Rentrée. So am I. Some people visit Nôtre Dame when they are in Paris. Not me. I’m spending my week exploring building supply stores – Batkor, Leroy Merlin, BHV and more – choosing materials and appliances for my newly purchased apartment. My transportation is a well-used white van. My companion is Dariusz, a congenial, efficient contractor. And my makeup is plaster dust. 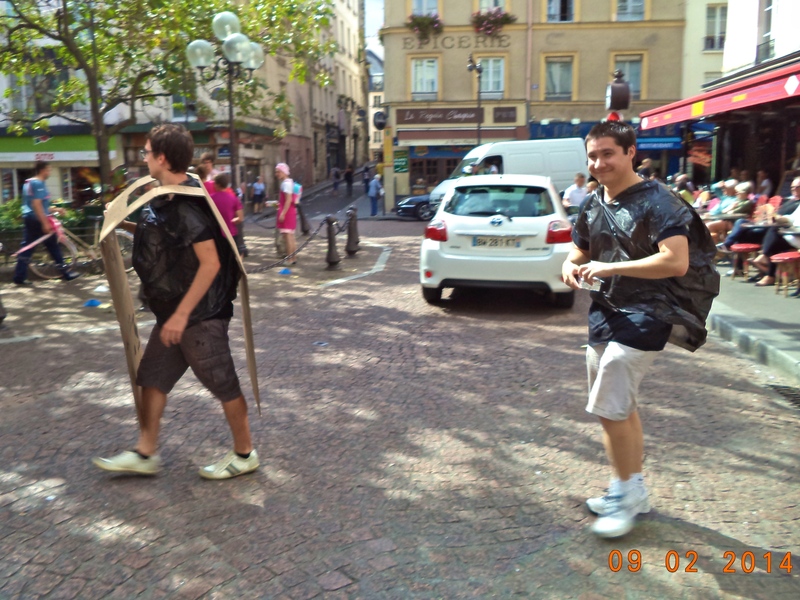 Dariusz is young – only 28 – but my realtor, who recommended him as un homme de l’art*, was correct. Dariusz has a decorator’s eye and solid skills. What he doesn’t have is – English. He is Polish, and our only common language is imperfect French, supplemented by gestures, hand-drawn diagrams, and shared enthusiasm. I finished the apartment purchase Monday and must return to the US on Saturday – leaving four days to make renovation decisions for an apartment that has not been updated since the 1970s. Ancient wallpaper, 40-year-old carpet, shredded curtains, aged appliances, dark tiles – everything is battered, grungy and unusable. So, Tuesday morning I’m waiting in front of the building when Dariusz scoots his van into an illegal spot. “Vite, vite!”, he calls, sweeping a pile of rulers, invoice forms, maps and empty coffee cups from the passenger seat so I can scramble in. Dariusz seems to fill the truck. Though hardly taller than I, he is what the French call costaud – sturdy, solid and muscular – with a sweet round face ringed with close-cropped black hair. He wraps his arms around the steering wheel, pulls forward and launches into a stream of Polish-accented French – commenting on traffic, apologizing that he didn’t clean his truck, and explaining, amused, that I am the rare client who actually wants to explore the aisles of appliance stores, lumberyards and paint shops. What an education this is. Ivry-sur-Seine, the district where most of our stores are located, was once just a dot on the Métro map. Now I know that this area, east of Paris’ center, has been rebuilt into a modern and appealing neighborhood, somehow preserving the spirit of its former docks and factories. I have also heard Dariusz’ personal version of the migration of Poles worldwide: He has a brother in the UK, a sister in the US, cousins in Australia and parents still in Poland. At the end of our whirlwind days, the apartment is in deepest demolition. The kitchen is an empty shell. The ancient wall-to-wall carpet is covered with a storm of paint and plaster chips. Bathroom fixtures in plastic wrap sit like ghosts in the dark bedroom. The hall closet, dismantled, awaits the washing machine. My beautiful marble fireplaces hide behind stacks of kitchen cabinets. Tools, ladders and unidentifiable hardware are littered everywhere. But I am leaving for the States. Dariusz must execute the apartment design, refine our color choices, and meet my deadline. Necessity is the mother of trust. 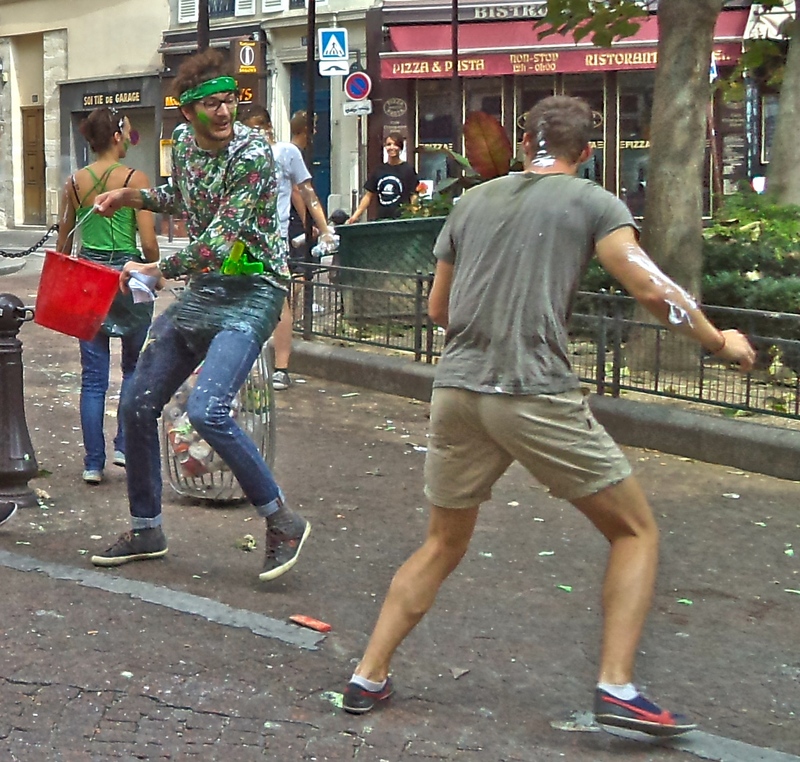 My Parisian friends predict that, in my absence, the work won’t get done, or will be shoddy. But I wave to the workmen and head for the plane. The happy, lucky outcome: I returned two months later to a practically perfect renovation. The ancient wood floor gleamed. The kitchen was stunning. Chandeliers sparkled. There was no furniture yet, but I danced around the empty space. A new adventure began. 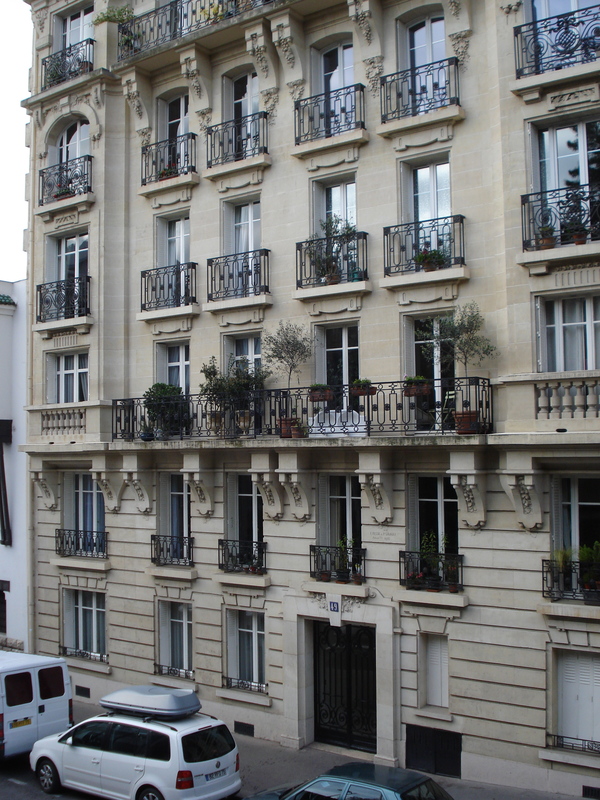 When I tell people that I’ve bought an apartment in Paris, some friends say, “That’s fantastic!” But many people ask, “Why?” That question makes me pause – the apartment is such a part of me, I have trouble explaining. 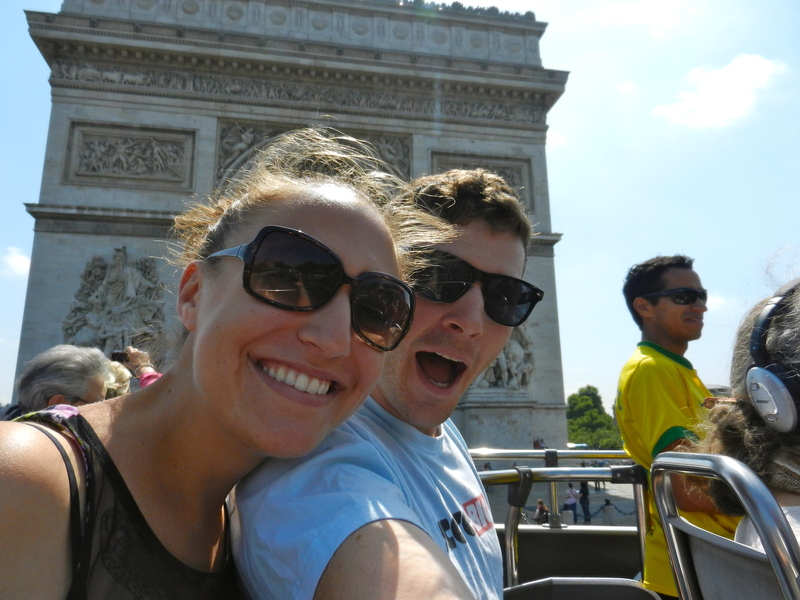 Perhaps the best answer is – buying a place in Paris brought me full circle, back to a lifelong passion. My mother started it all. She grew up in the 1920s, when France was the undisputed center of the civilized world. 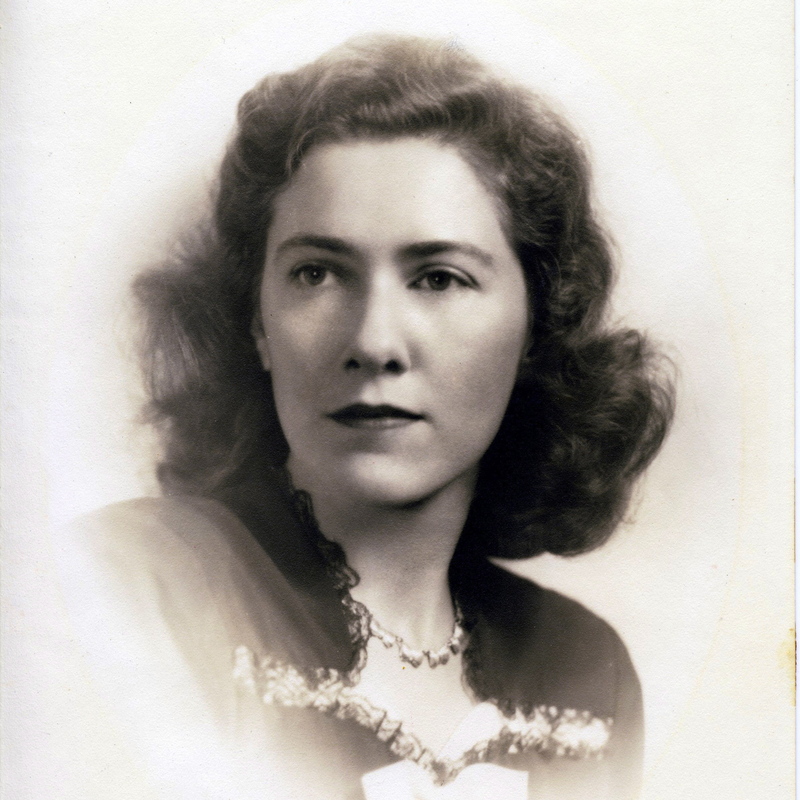 She made it clear to her daughters that the Continental life was the epitome of fine culture. I inherited her taste for languages, majored in French, studied in southern France. Sometime in that period I stopped doing things to please her and started doing them for myself. I adored standing in the light streaming through the windows of Sainte Chapelle. 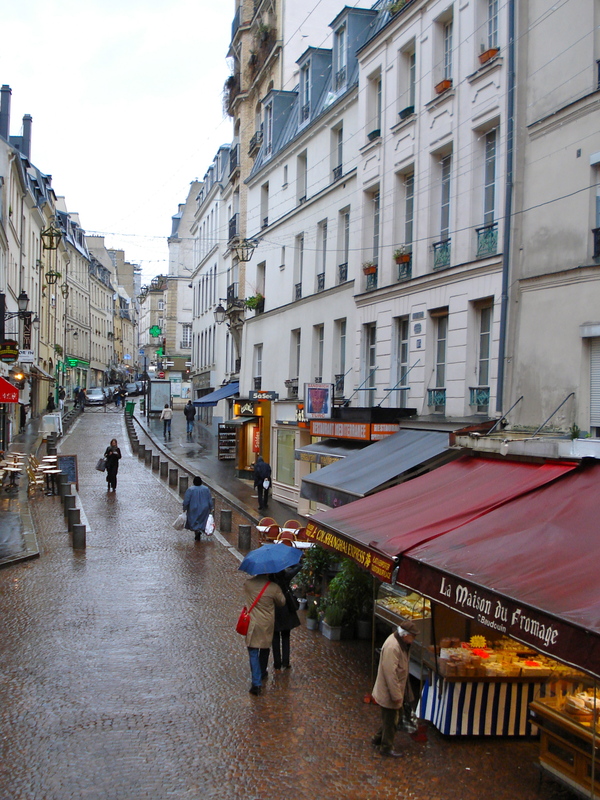 I was enchanted by the winding cobblestone streets of the Latin Quarter. I delighted in buying cherries in the Marché des Enfants Rouges and eating them in a tree-shaded park. Most of all, I fell in love with the sense of adventure and accomplishment that came from living in France. Then I stepped away from France and French for many years – to a family I love, a life in Massachusetts and a technology career. But the dream never went away. When I started consulting, I refreshed my language skills and found a few French clients. Buying the apartment made the cycle complete. Of course, there are lots of challenges and adventures. Where to buy an apartment, and how to afford it? 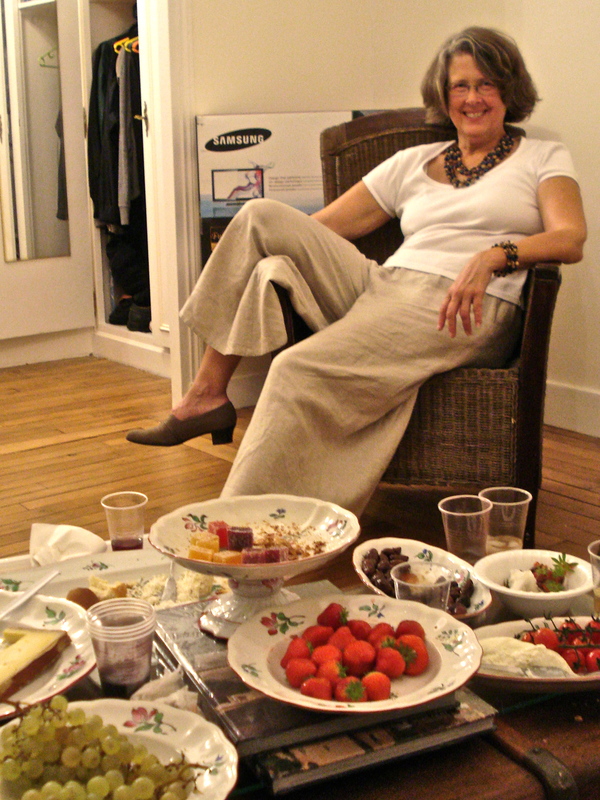 How to live an abundant part-time French life? How to stay close to friends and family on both sides of the Atlantic? Every day yields a new adventure. This is my place to share enlightening experiences, unusual places, useful suggestions and opinionated observations. Welcome to my Paris! Living room, launchpad for Paris adventures!